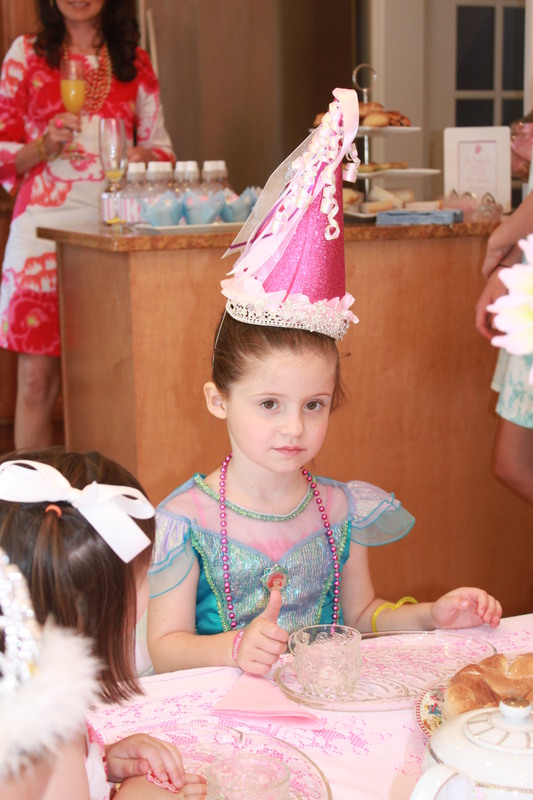 Me: Molly what theme do you want for your 6th birthday party? Molly: Well my best friend only likes boy things so I want to have a boy theme because I really want her to come. Me: Hmmmm…. does she like Dinosaurs? 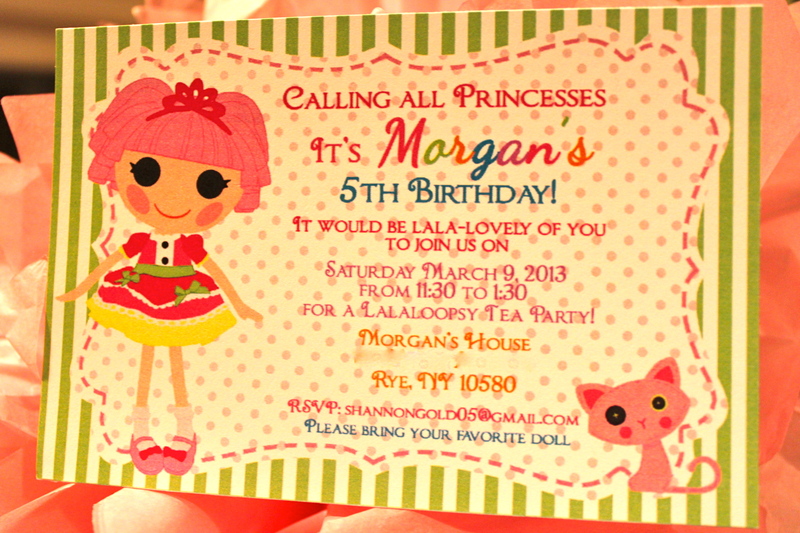 I’m so excited to post about Morgan’s Lalaloopsy Tea Party. 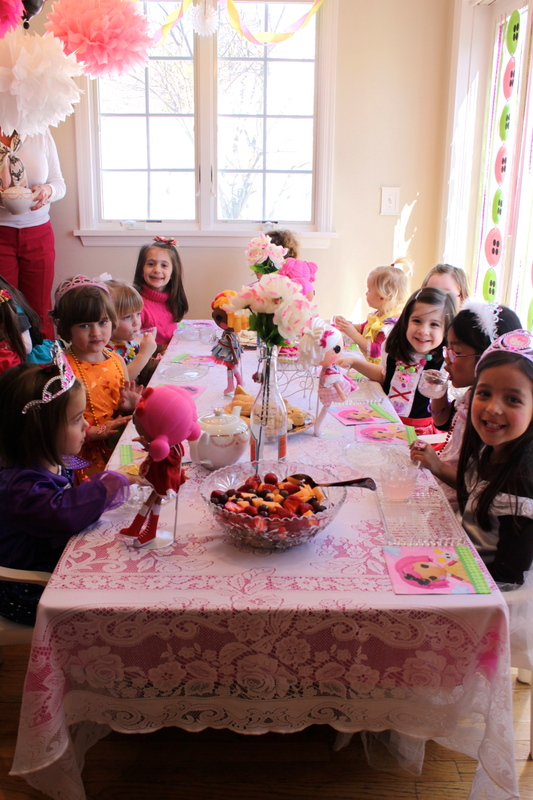 She has loved Lalaloopsy for two years now and wanted a Lalaloopsy party for her 5th Birthday. 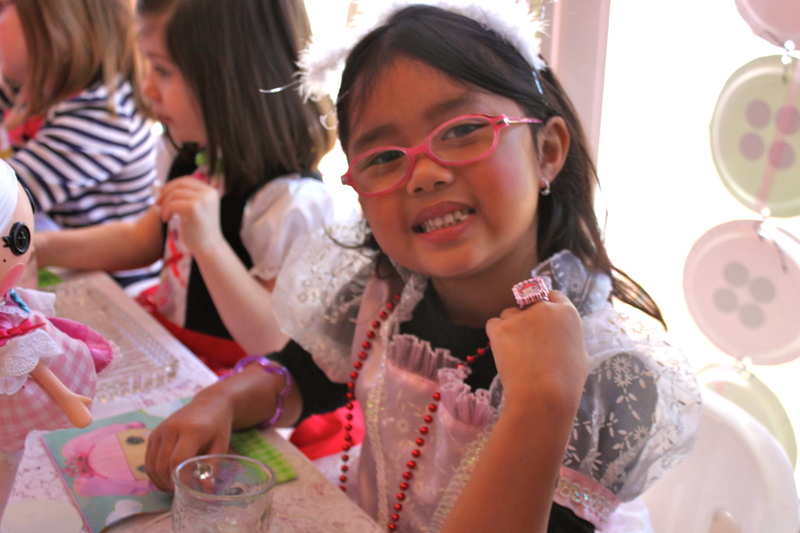 We decided that Jewel Sparkles was the perfect Lalaloopsy to base her party on since, according to Lalaloopsy Legend, Jewel Sparkles is made from remnants of a real princess’ dress, is very graceful, a little bit bossy, and loves to dance and wear sparkly clothes…sounds just like my little Morgan. This is the invitation I had created by Nancy at N’s Little Shop on Etsy and sent out to all 15 party guests. 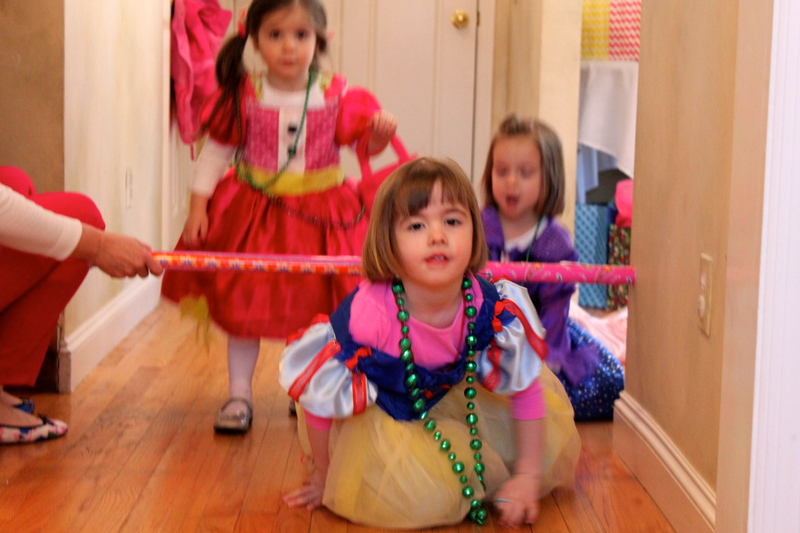 I wanted to have the party at home but needed to find entertainment for the little guests. 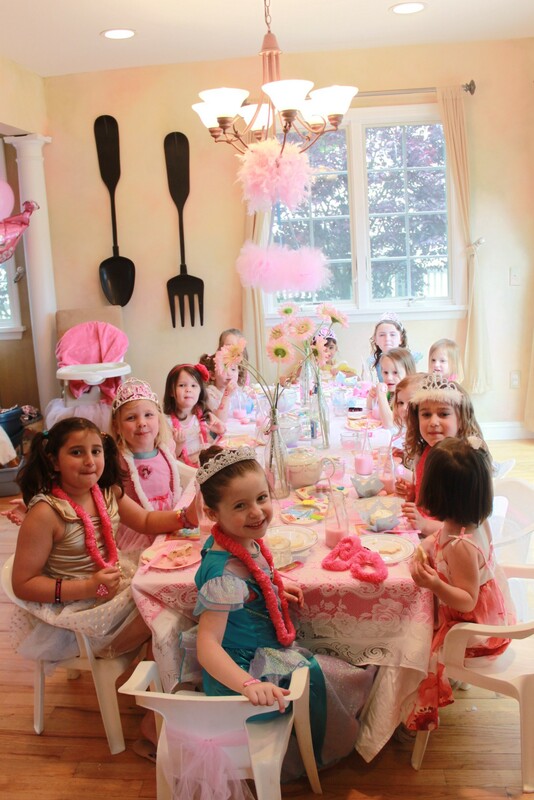 We thought combining the Lalaloopsy Princess theme with a tea party would be fun, so I enlisted the help of Eileen Phelan of Princess Tea Parties to help. 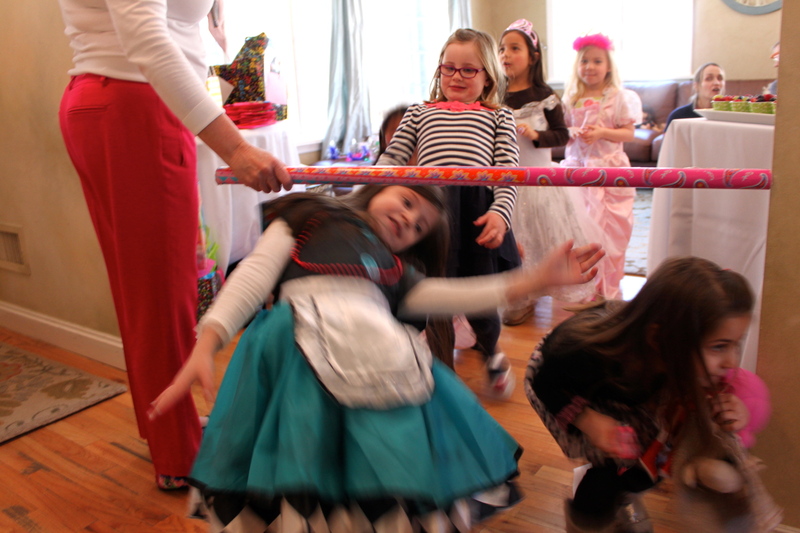 I already knew she was fabulous as we used her for Madison’s 5th Birthday Party as well. 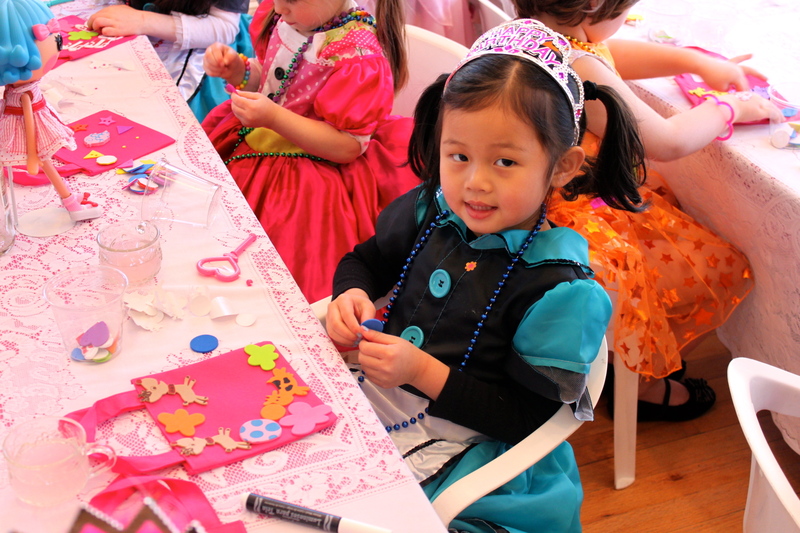 She wasn’t familiar with Lalaloopsy dolls, but reassured me she’d research and learn about them before the party. 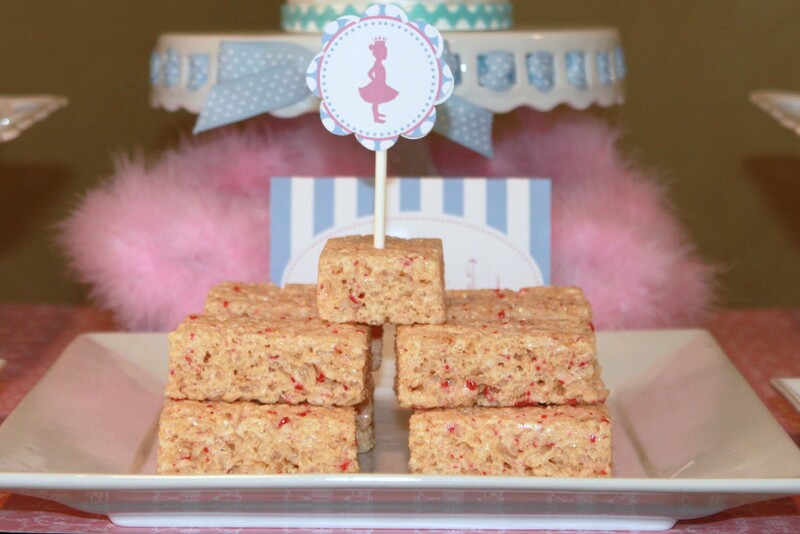 After securing Eileen two months in advance (she is very busy and you need to book early), I began gathering inspiration for the party on Pinterest. 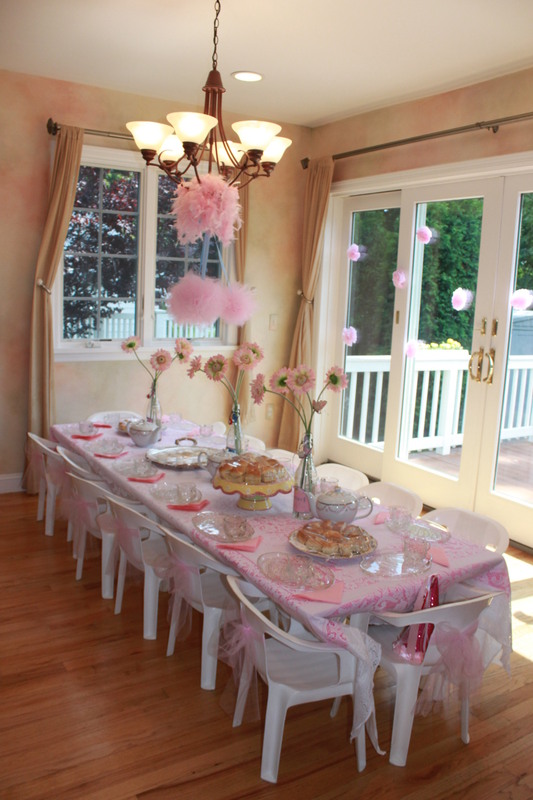 There are so many inspiring photos out there and I used many of them in creating the decor for this party. 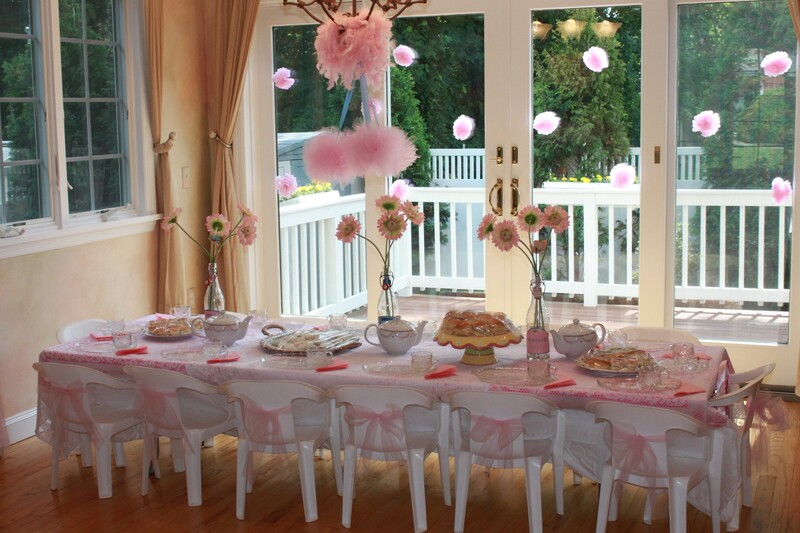 I knew Eileen would be creating a beautiful tea party table complete with lace table cloths, flowers in french lemonade bottles, crystal plates and cups, silverware, trays of finger sandwiches, and tea pots, so I concentrated on transforming my dining and living room into a Lalaloopsy Land fit for a princess. All Lalaloopsies have buttons for eyes, so I went with that detail and created large buttons from paper plates and strung them together. 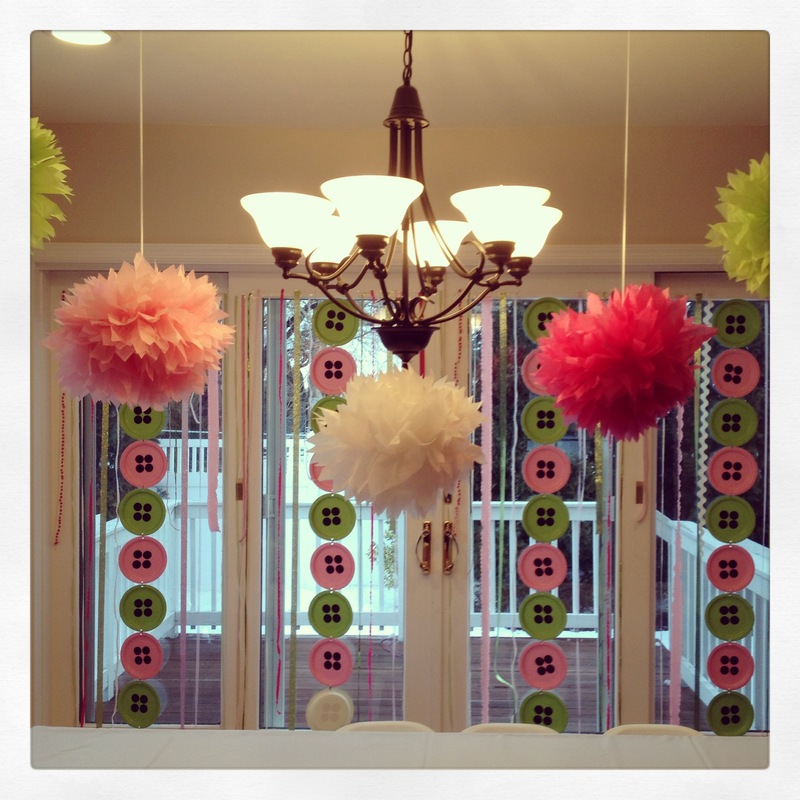 I hung these on my sliding doors in the dining area. I filled in the spaces in between with pink, green and white ribbon. It made a lovely backdrop and helped set the mood for the party. 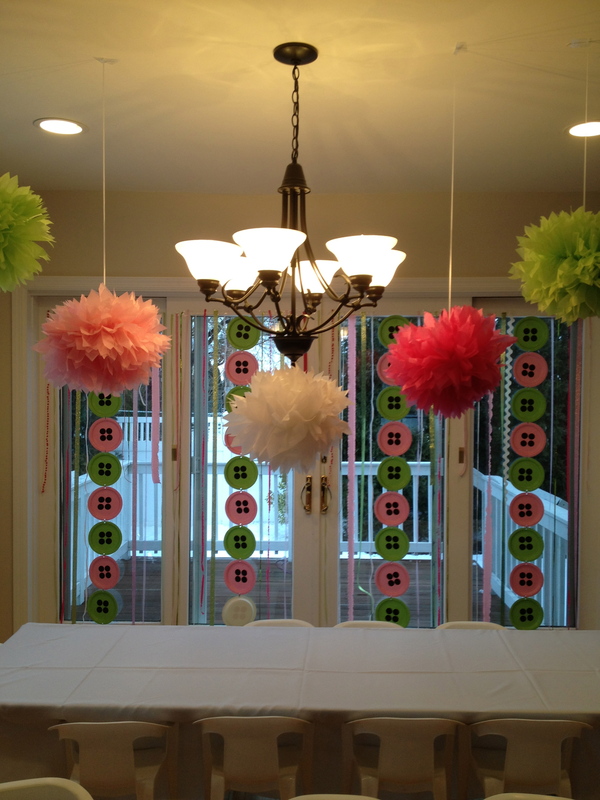 I also hung large tissue paper pom poms by Martha Stewart down the center of the room. 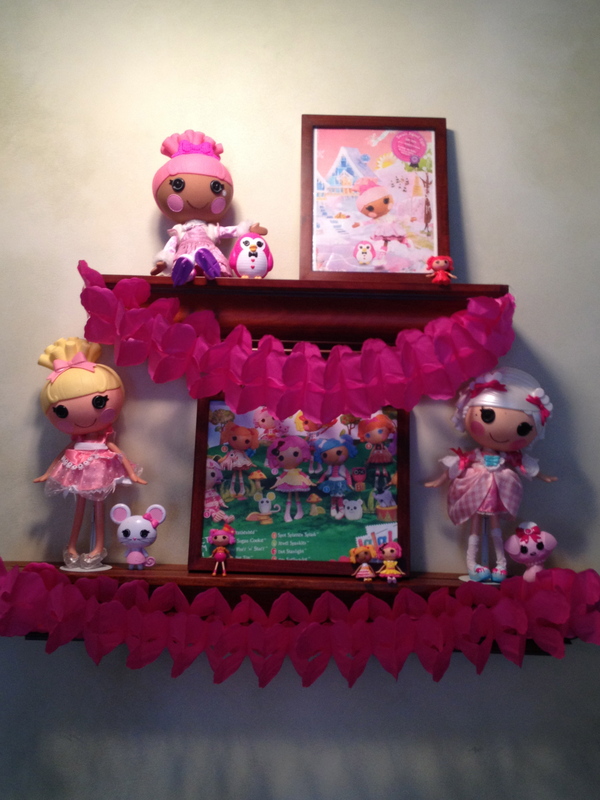 My girls have a large collection of Lalaloopsy Dolls, so I incorporated them throughout the house. 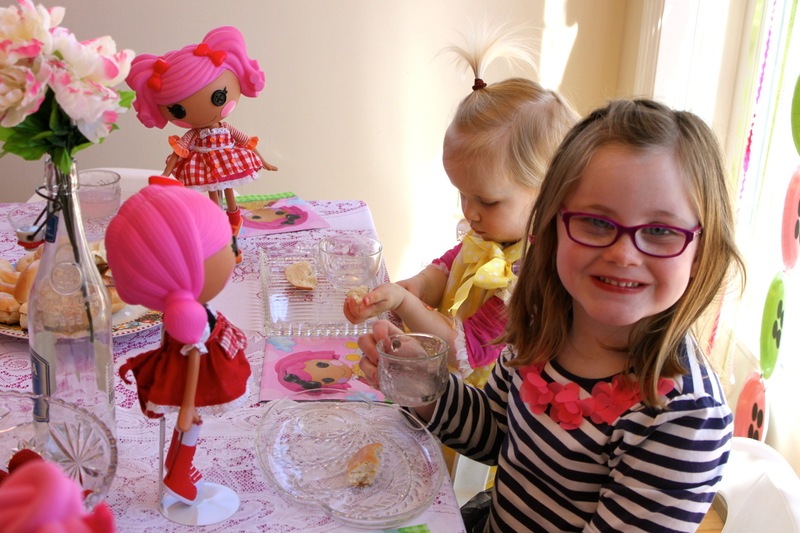 The leftover doll stands from Madison’s Barbie Party really came in handy. 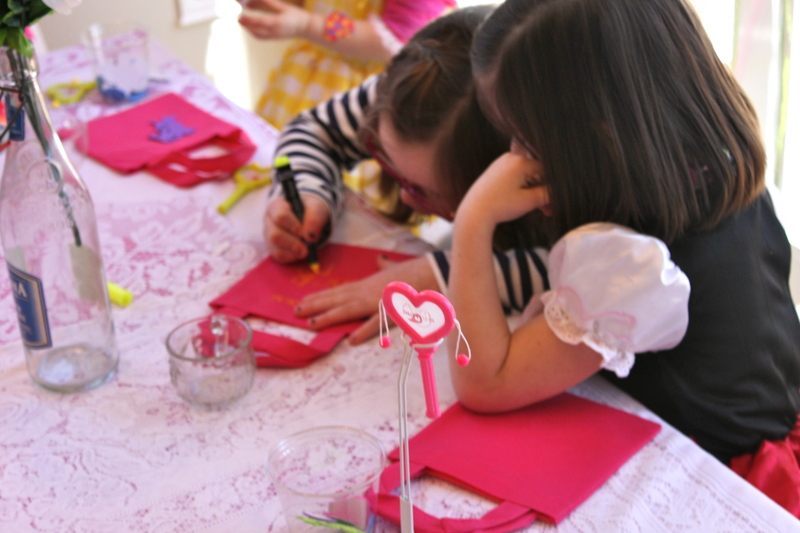 The colors I used throughout the party were pink and green. 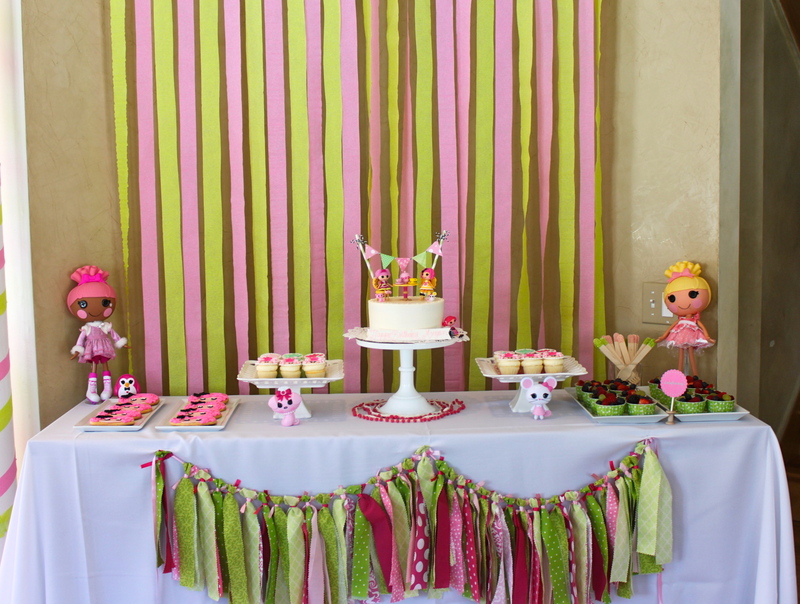 I used pink and green streamers for the backdrop for the dessert table. My mom helped me by stapling the streamers to a string and then we hung the string in the corner of the room behind the table. 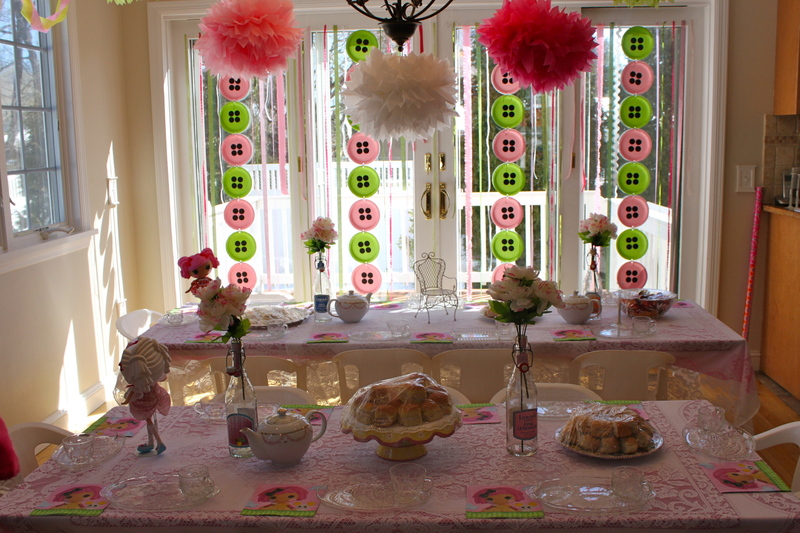 I hung a fabric garland on the front of the table. 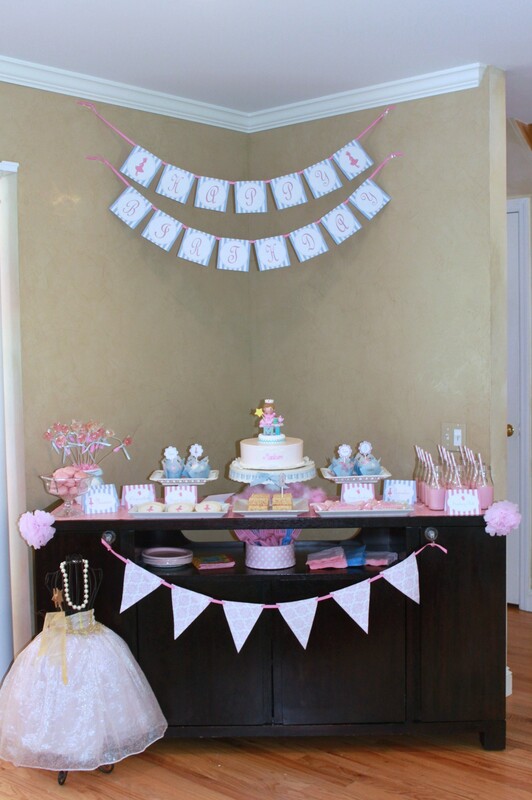 The garland was designed by Whimsically Detailed, a great site for custom party decor. 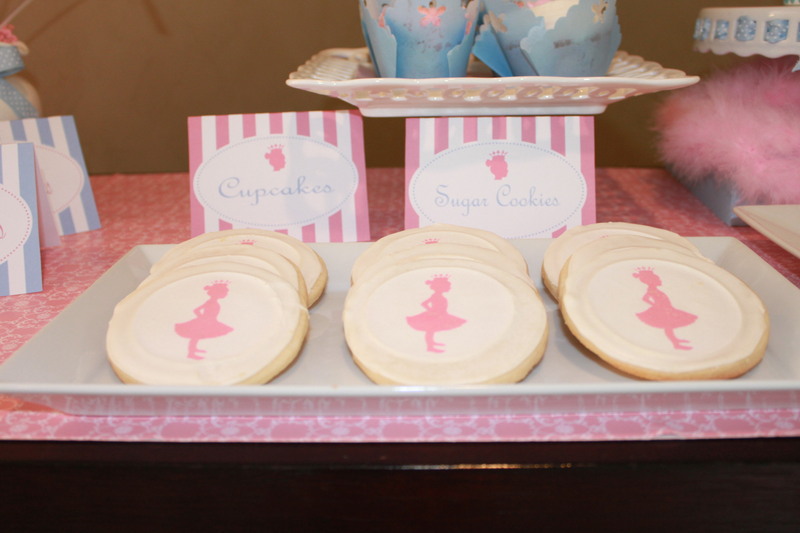 Included on the dessert table were these adorable cookies by Carrie Budke, a Rye local. 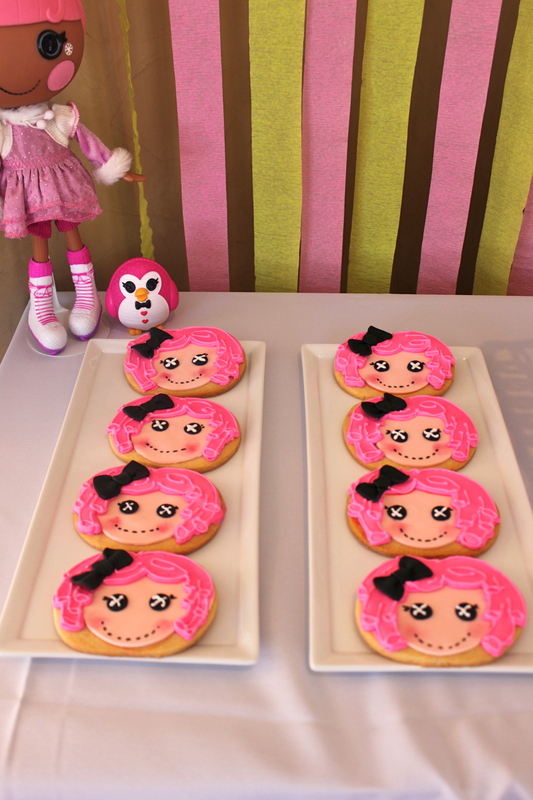 The cookies look like Crumbs Sugar Cookie, another Lalaloopsy. Carrie makes fabulous cookies and made these with two days notice. Thanks, Carrie! 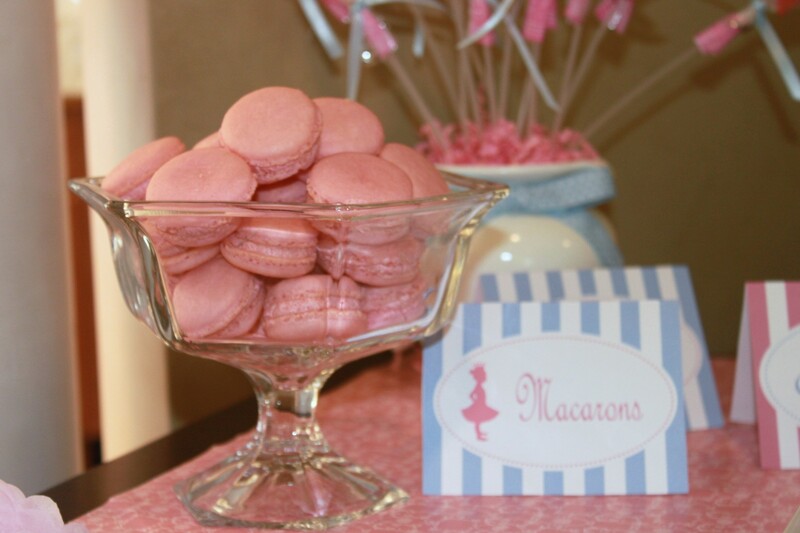 I ordered these gorgeous fondant cupcake toppers from Top Cake Decors on Etsy. 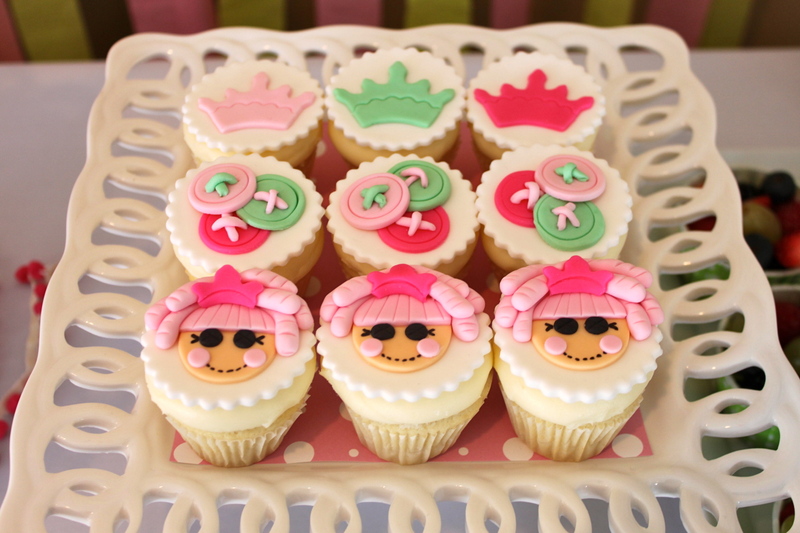 I had 350 Classic Bakeshop, a local bakery, bake mini cupcakes and place the toppers on them. They came out great. 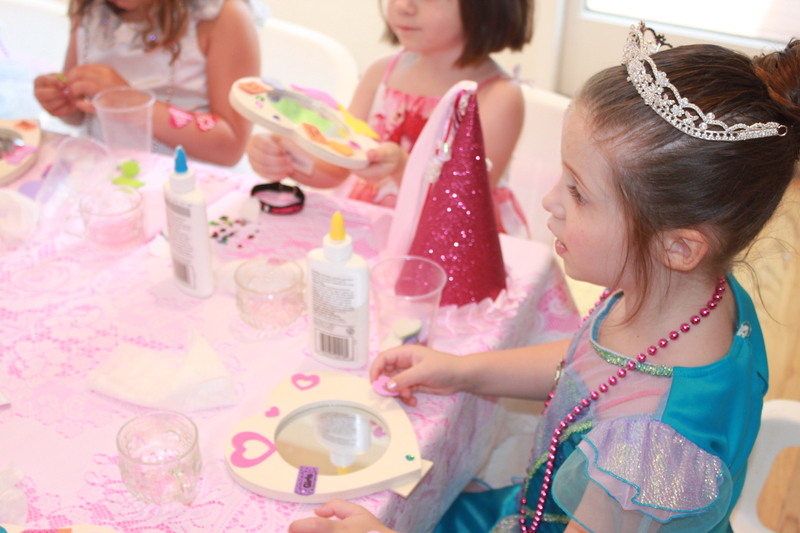 How cute is the Jewel Sparkles topper? 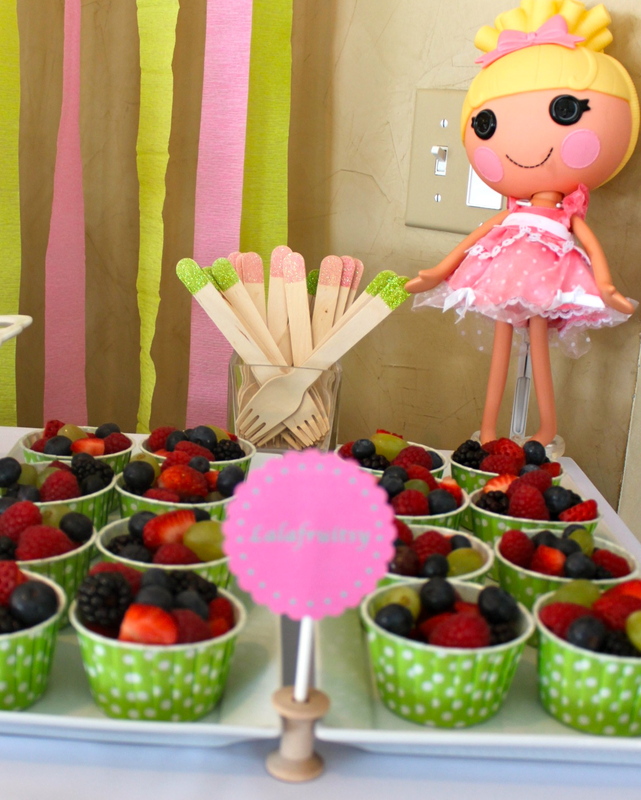 I made little fruit cups that I called “Lalafruitsy.” I ordered the green polka-dot cups from The TomKat Studio and they were perfect for mini-fruit cups. I loved that they are lined with wax, so they didn’t get wet and soggy from the fruit. I found the cutest glitterized forks from Whimsically Detailed to use to eat the fruit and cake. We always have so much cake leftover so I went with a 7-inch round cake from Cornerstone (the smallest they make) and we still had leftovers! I got a plain white cake so I could decorate it. 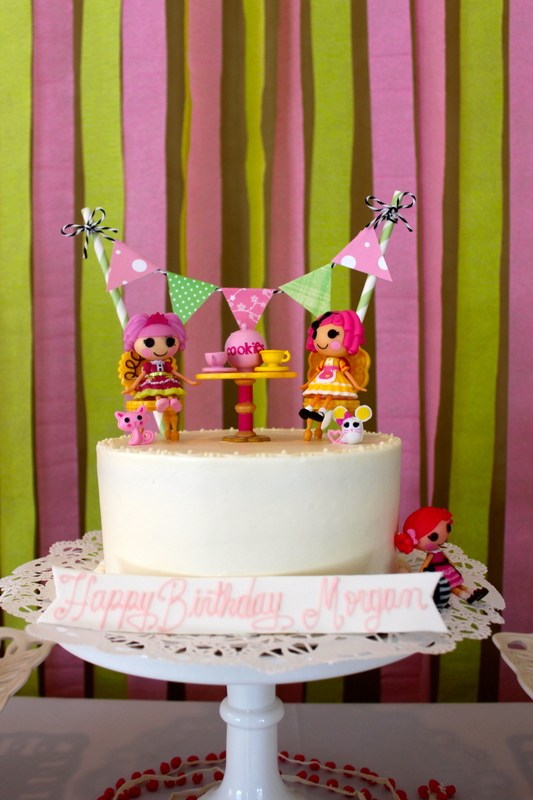 I topped it with a Lalaloopsy Tea Party set featuring Jewel Sparkles and Crumbs Sugar Cookie. 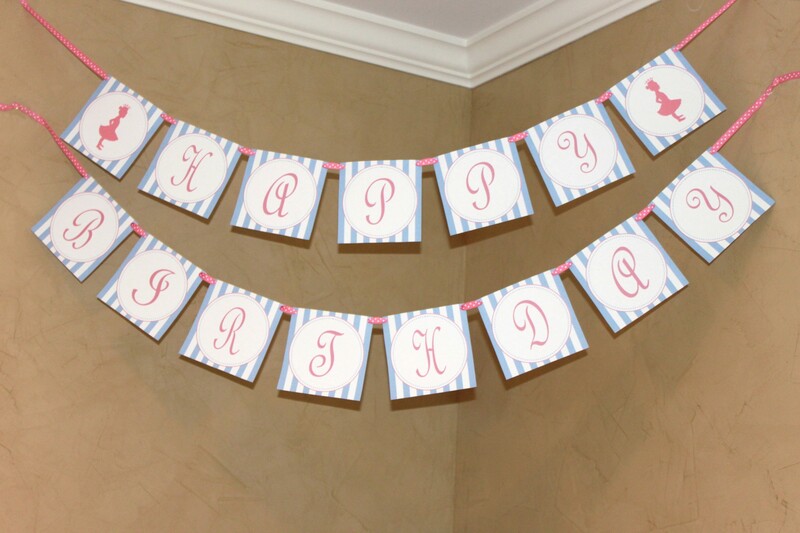 I made the banner topper using scrapbook paper, bakers twine, and paper straws. into this. She is AMAZING! 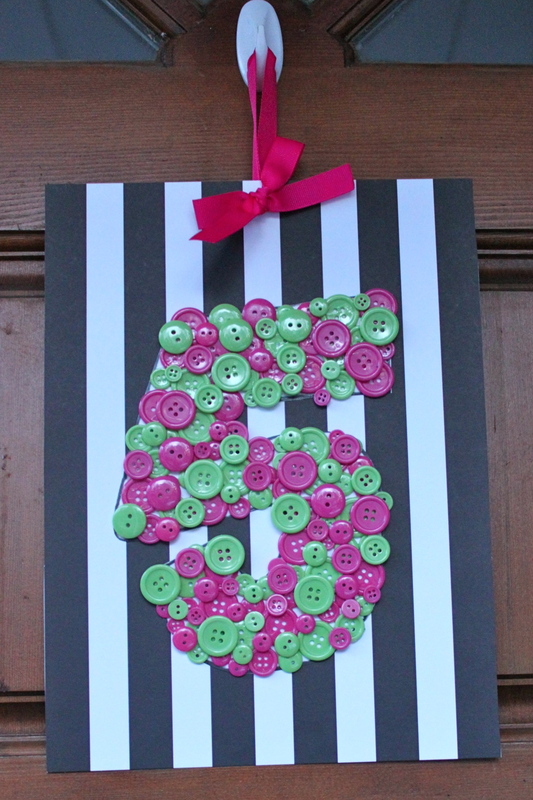 A welcome sign hung on the front door…I made a number 5 out of buttons. 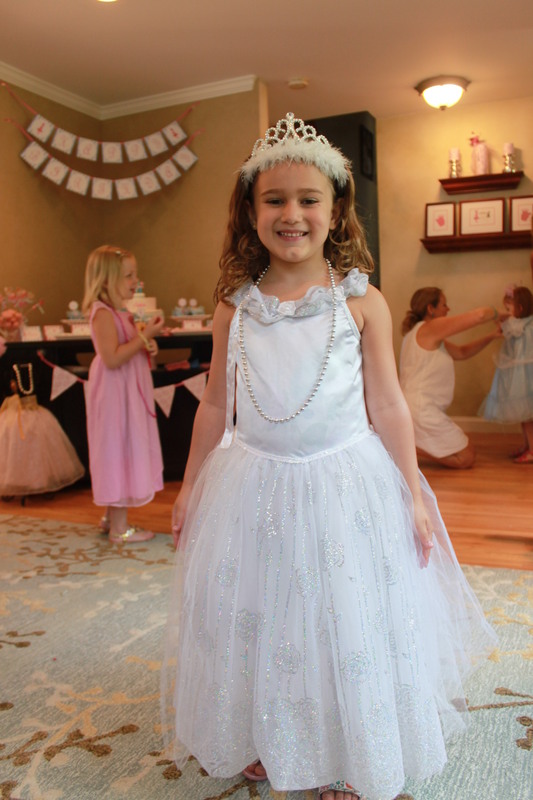 Morgan wore a custom shirt designed by Rowan May Fairs on Etsy that I paired with a green tulle skirt from Gap Kids and a Jewel Sparkles chunky necklace from Etsy shop, Twincess Inspirations. 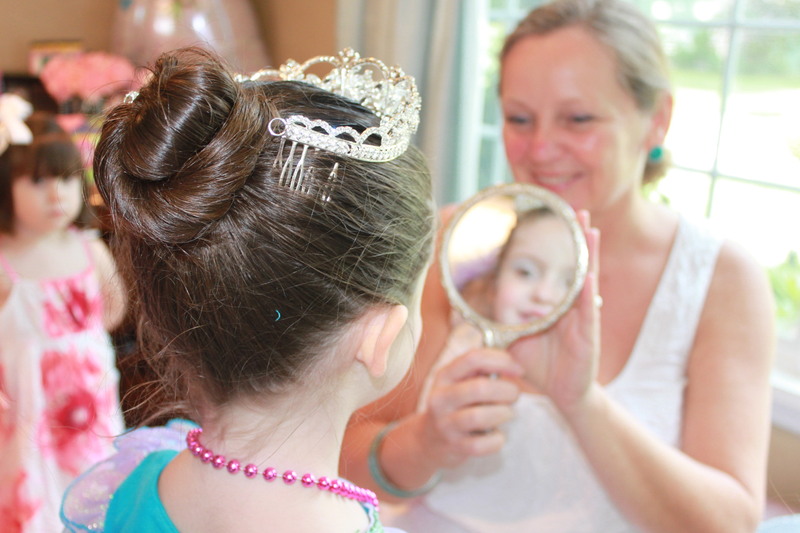 Her Jewel Sparkles hair clip is from Tutus and MudPies. 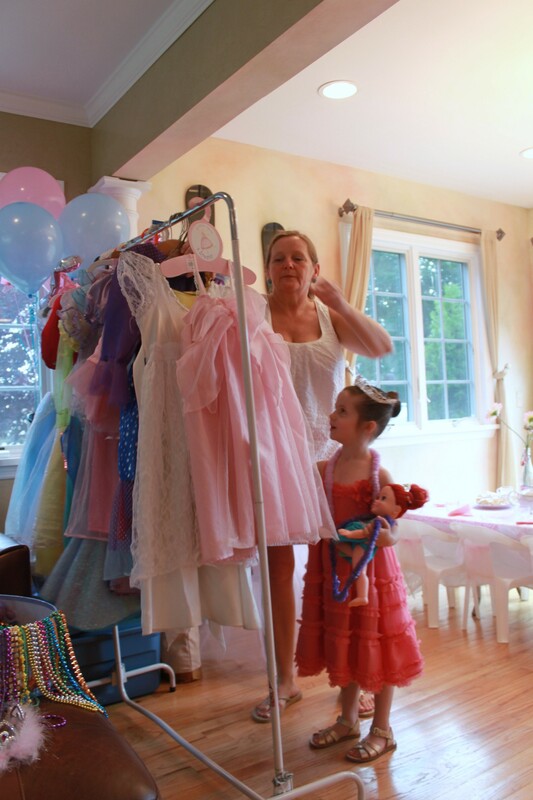 As the guests arrived, they chose princess costumes from Mrs. Phelan’s dress-up rack to wear to the tea party. 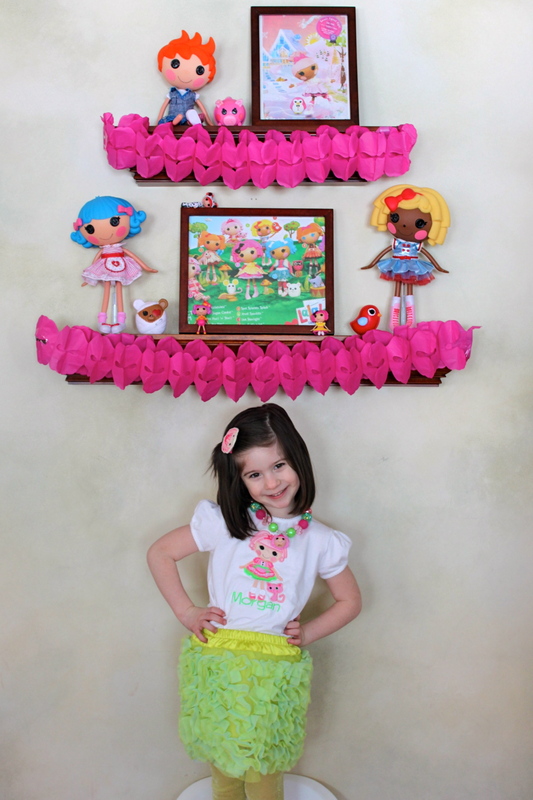 I also put several Lalaloopsy costumes on the rack for the girls to wear. 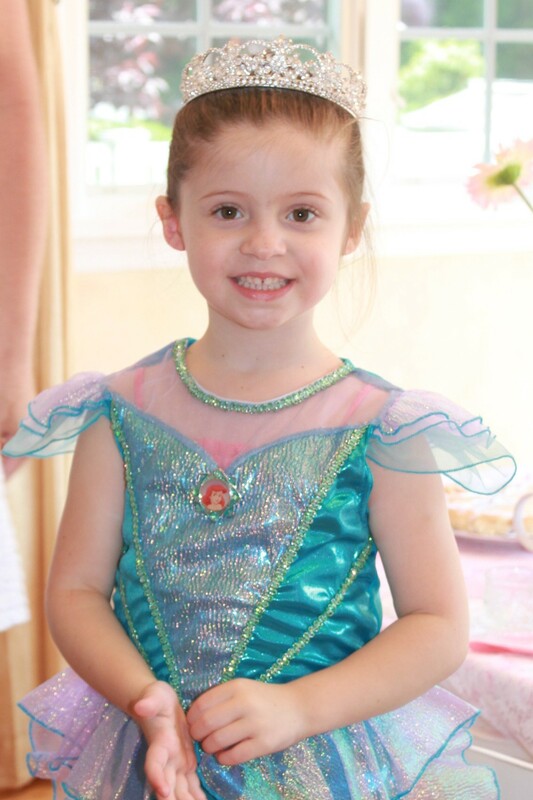 Here’s my little Molly wearing Jewel Sparkles…. 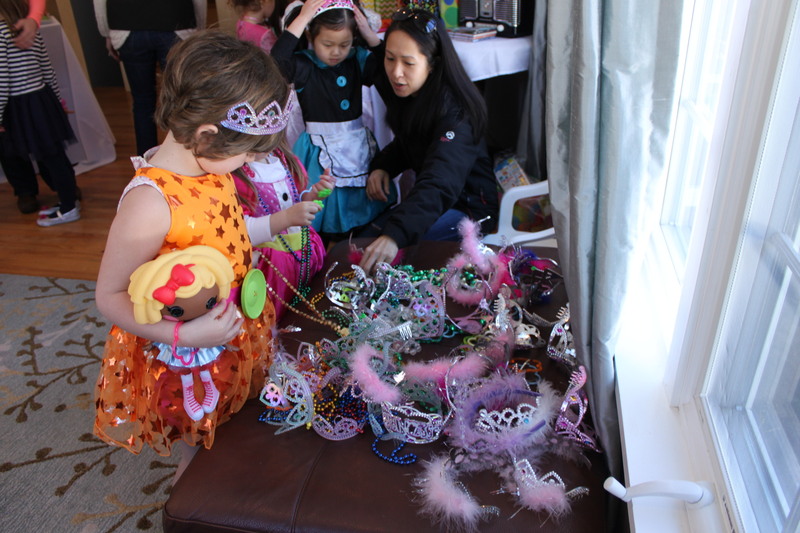 The girls also chose tiaras, bracelets, and necklaces to adorn themselves. 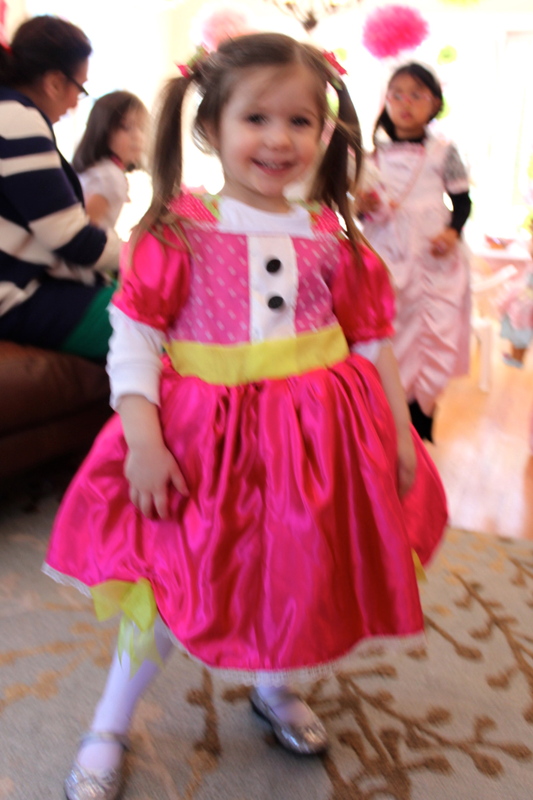 Morgan decided to wear the Lalaloopsy, Scarlett Red Riding Hood’s costume. That’s Morgan’s teacher, Mrs. Cheyne. She is friends with Eileen and came along to help. 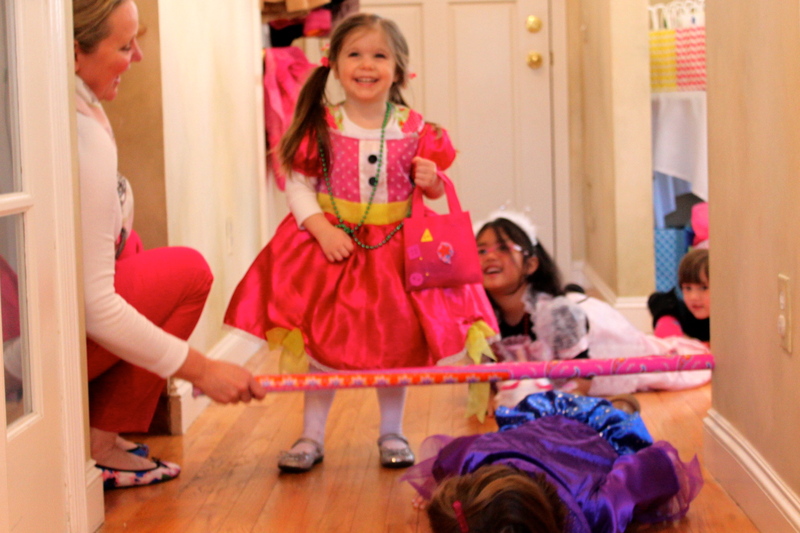 She surprised Morgan and all of her friends…many of whom are in her class. 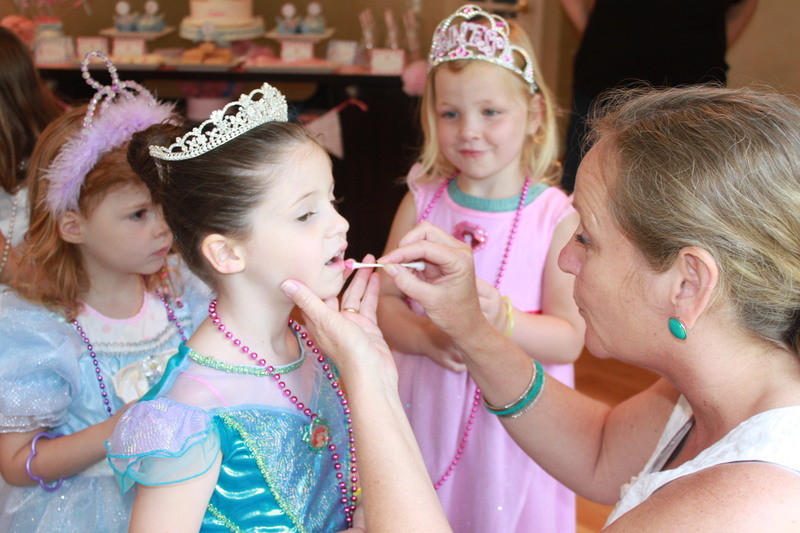 How cool to have your teacher at your birthday party! 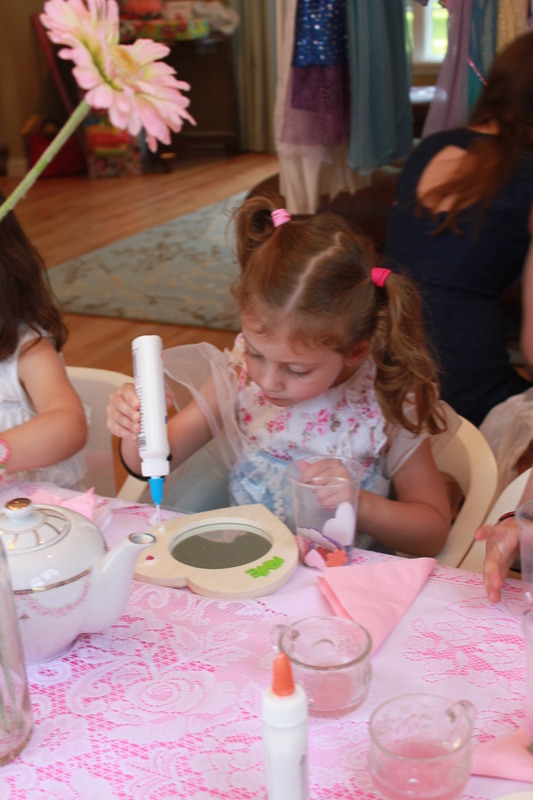 After getting their nails and makeup done, the girls sat down and the tea party began. 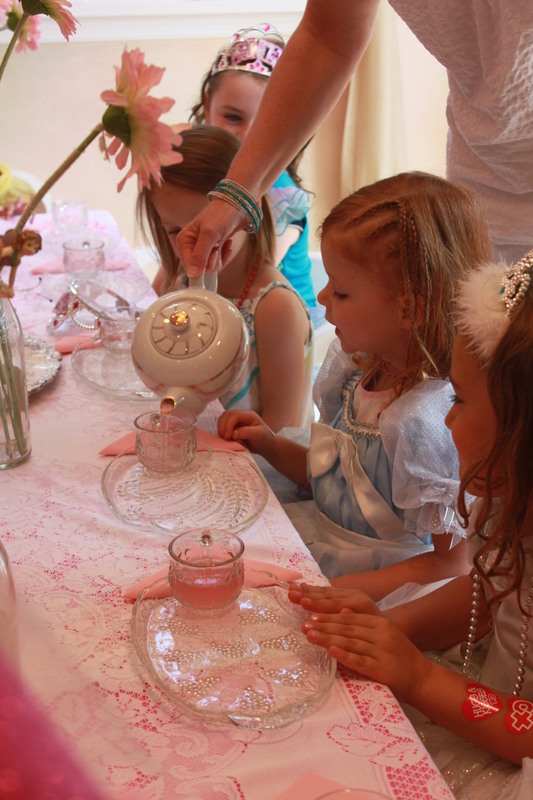 Eileen told the kids that she was serving magic tea and this tea will make you act like a real princess or prince (there was one little boy) and it tastes just like pink lemonade! 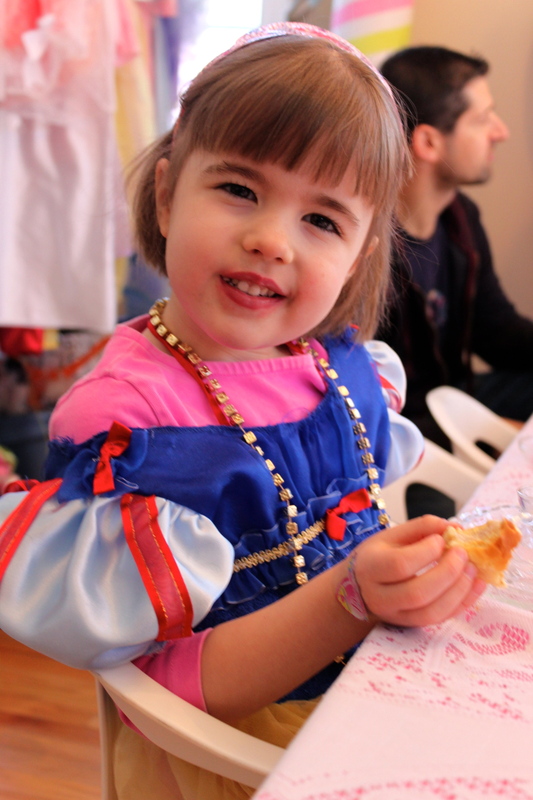 The kids ate mini turkey and cheese sandwiches, heart-shaped strawberry jam sandwiches, and bagels with cream cheese or butter. 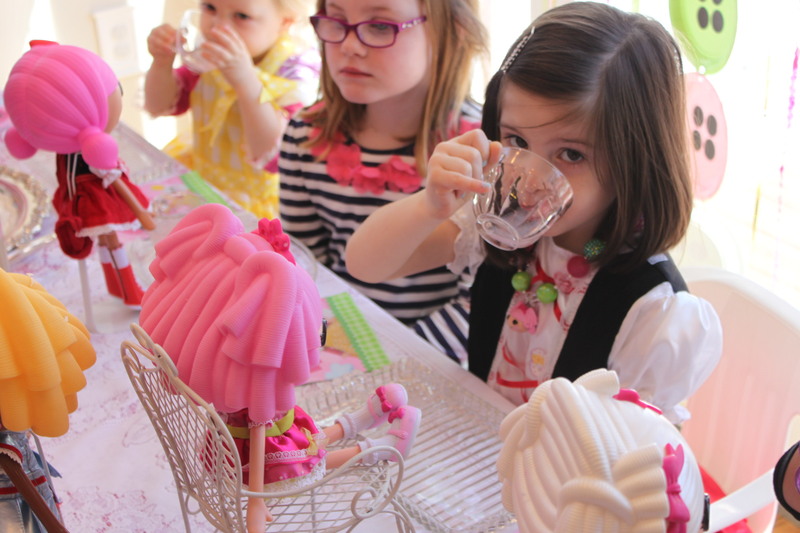 Many girls brought a Lalaloopsy doll to the party and I gave them a doll stand so their doll could join them for tea. 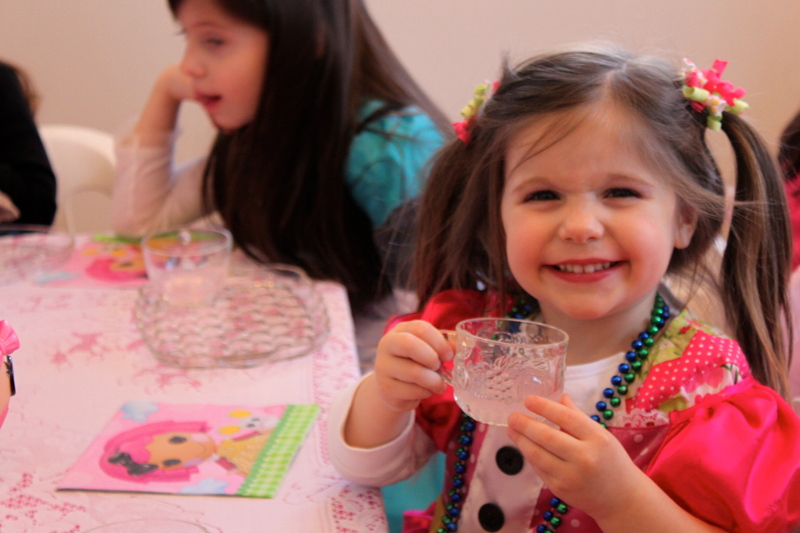 The kids were so good, they stayed in their seats, raised their hands for more food, and when they wanted more tea they said, “More tea, please!” with a princess voice. 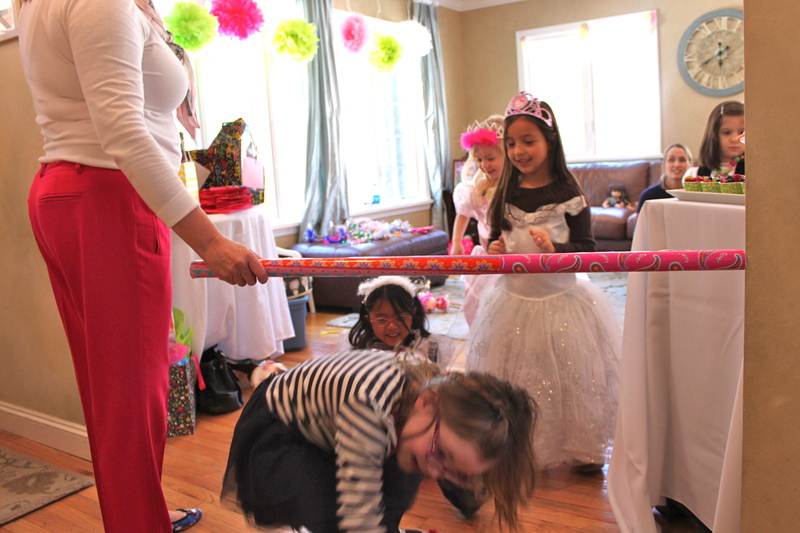 After lunch, they played freeze dance, hot potato, and limbo. It was so cute seeing the kids dance in their ensembles. 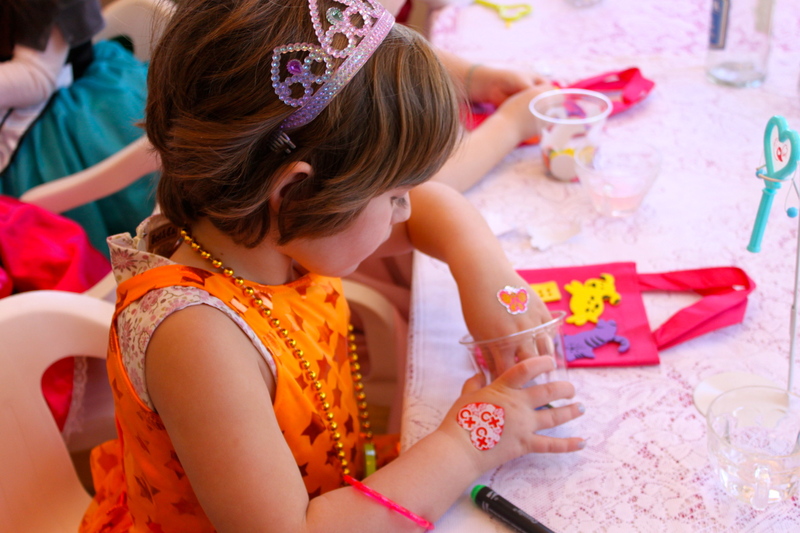 After playing games, the kids sat again for a sticker craft. 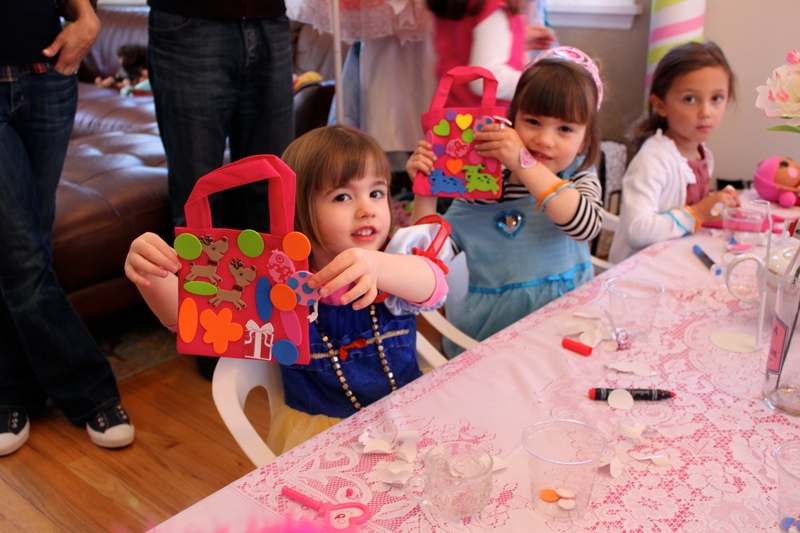 They decorated little pink canvas bags with foam stickers. 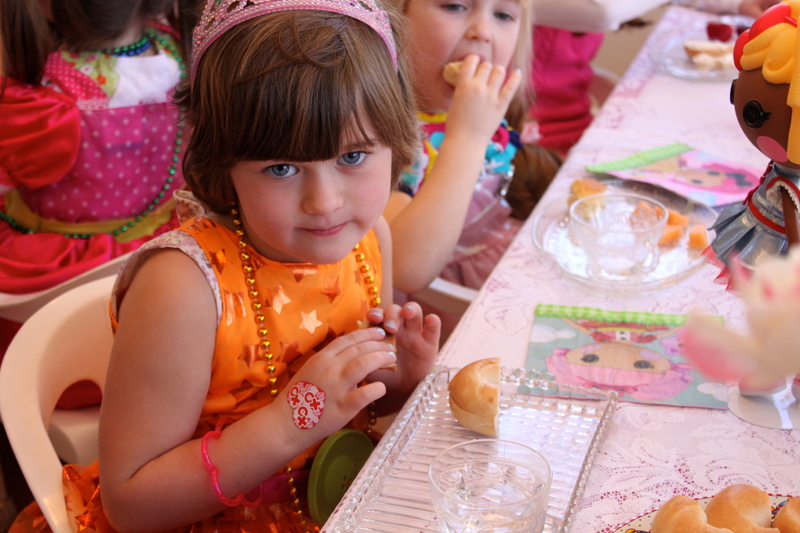 After the craft, it was time to sing Happy Birthday and enjoy cake, cupcake and cookies. 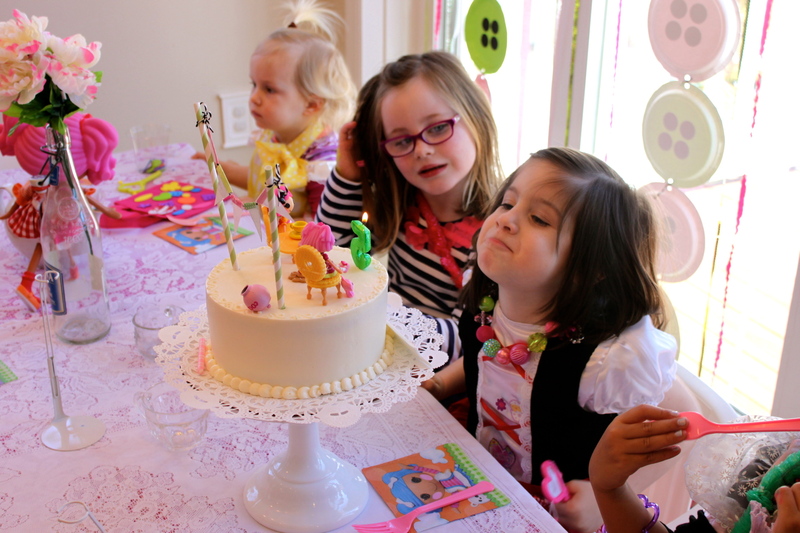 This is the only picture I have of Morgan with her cake. I wish I could recreate it and take more pictures. It was a great party. 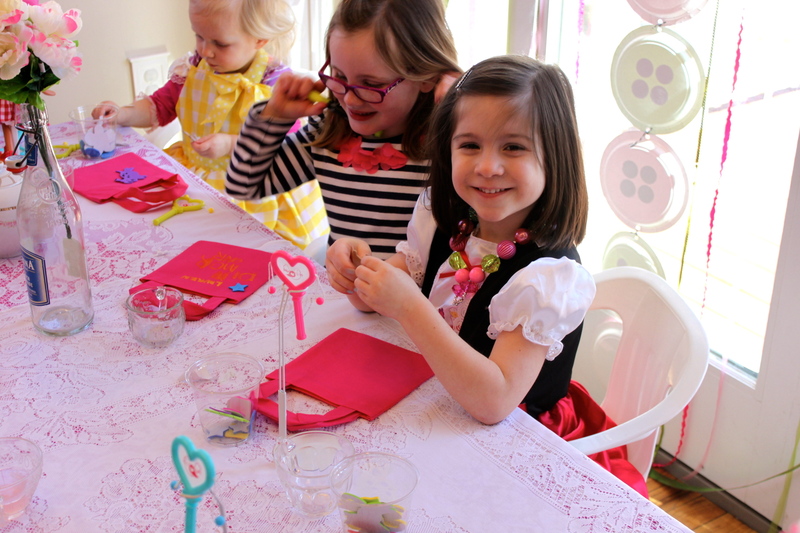 The kids seemed to have a great time and Morgan loved having all of her friends around to celebrate with her. 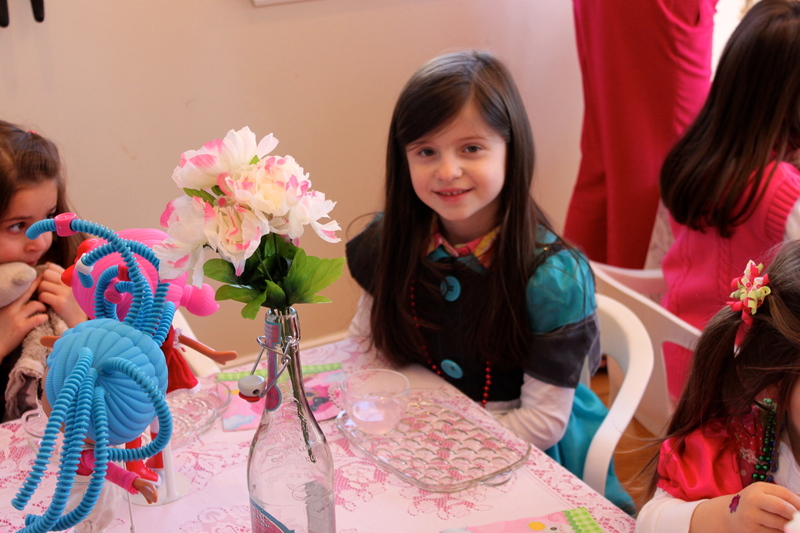 I was so glad I could create a party for her that includes some of her favorite things at this age. 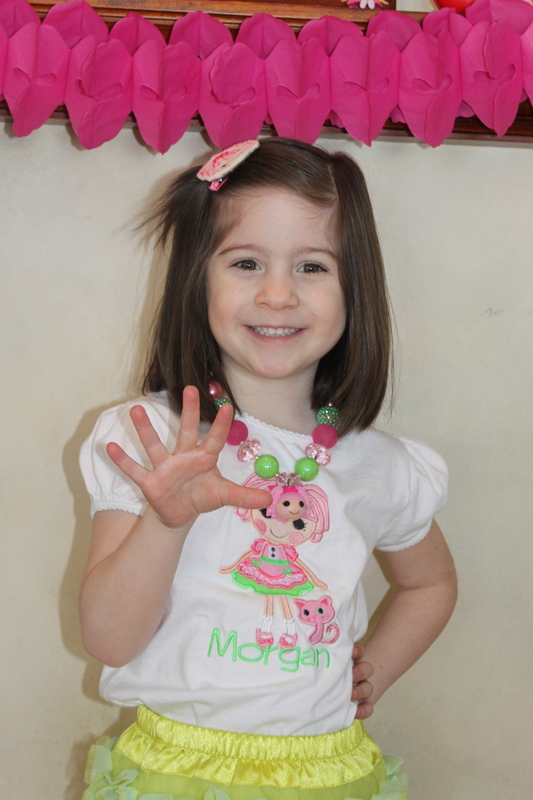 Happy 5th Birthday Morgan Paige, you are the sweetest, most special girl in the whole world. I love you with all my heart. P.S. 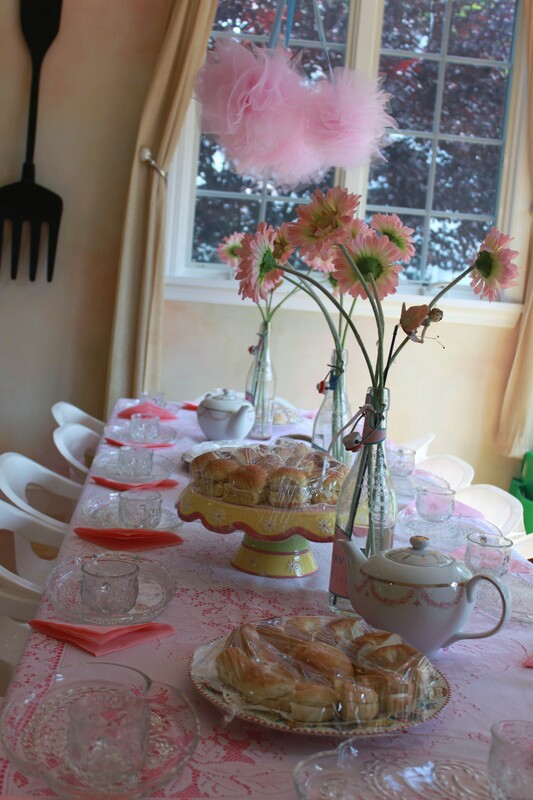 If you would like to have a Tea Party Birthday Party, call Eileen Phelan at 203-532-0547. 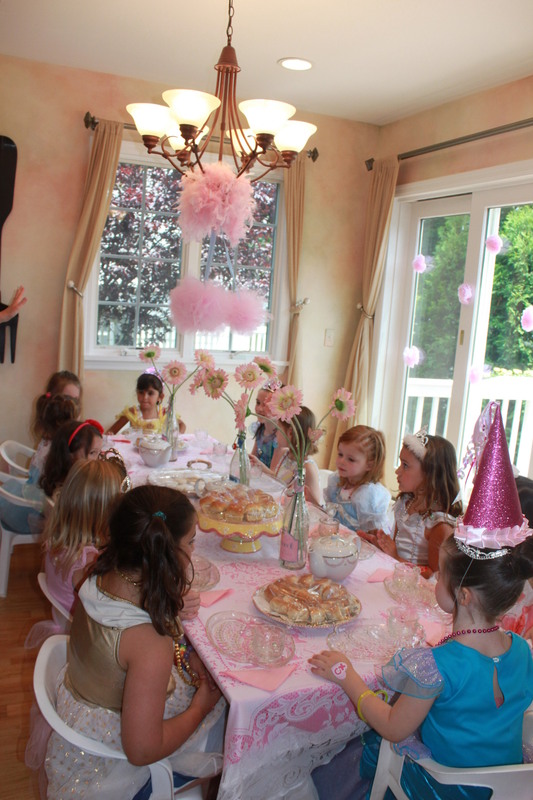 The price is very reasonable and she is willing to work with you to give you the tea party you envision. I also wanted to share a tip I found very helpful. 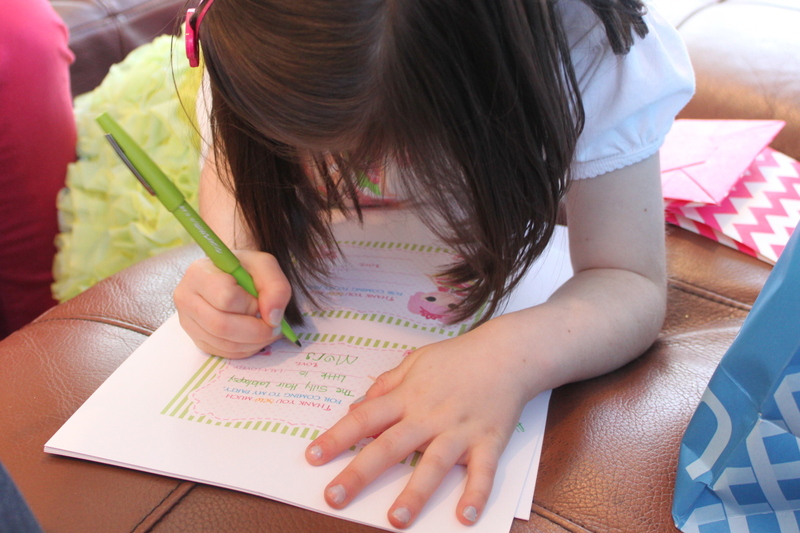 I had thank-you cards printed in advance and as Morgan opened her gifts, I filled in the blanks on the card with the gift and Morgan signed her name. I never did it this way before, but it went so smoothly and allowed her to slow down and appreciate the gift one at a time. I had Nancy at N’s Little Shop on Etsy create Fill-in-the-Blank Thank You’s that matched the invitation. 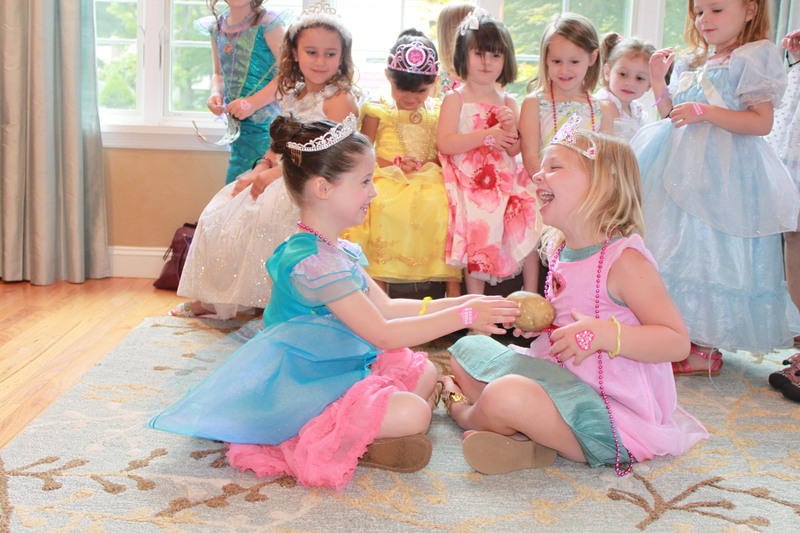 I hope you enjoyed the details that went into this party. Thanks for visiting the blog! 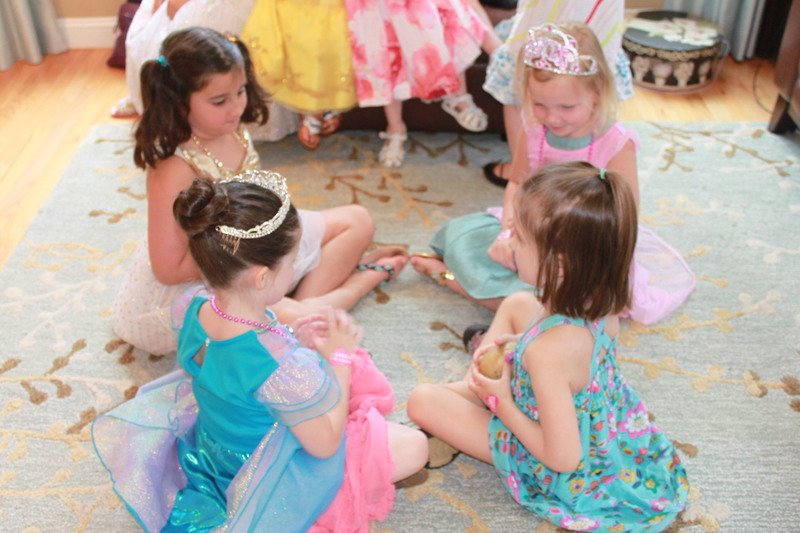 After this post, I will finally be up to date with posting all of my children’s parties up to this point…Phew! 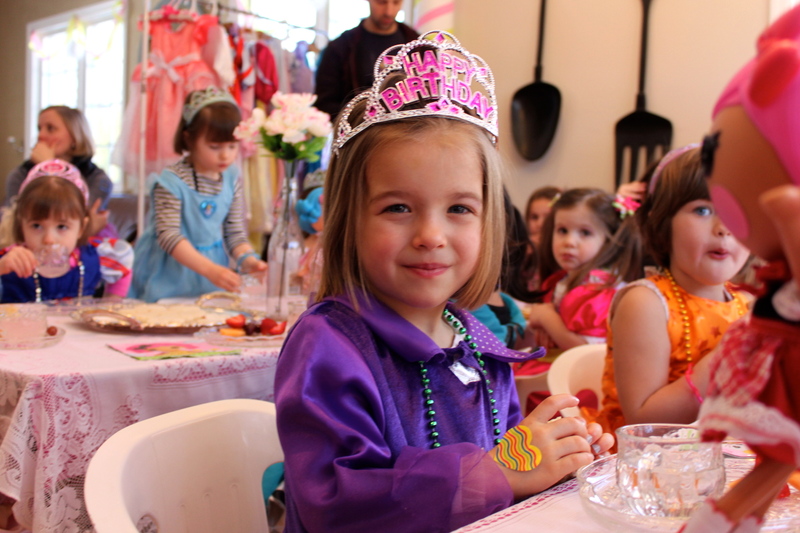 I hope to start blogging more about party planning as I embark on planning the next birthday party which will be Morgan’s 4th birthday in March. 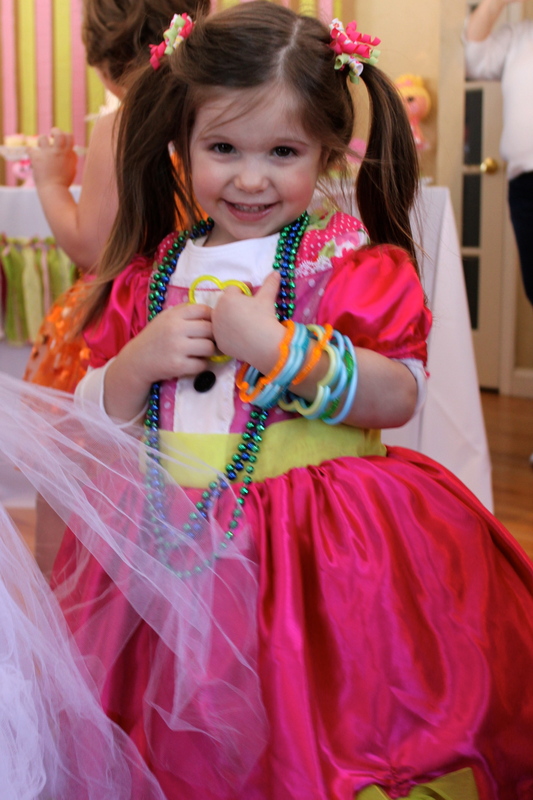 The theme yet to be determined, but she talked about wanting a Care Bear party, so we’ll see. 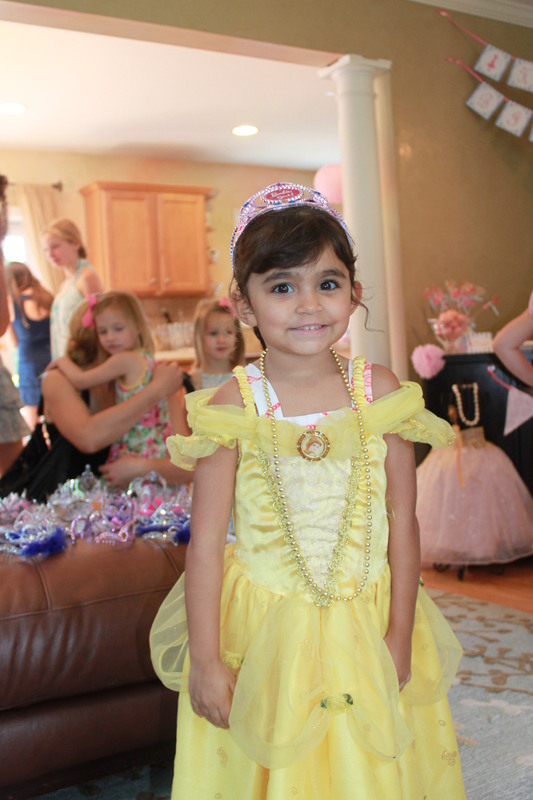 In June, I threw Madison a 5th birthday party. 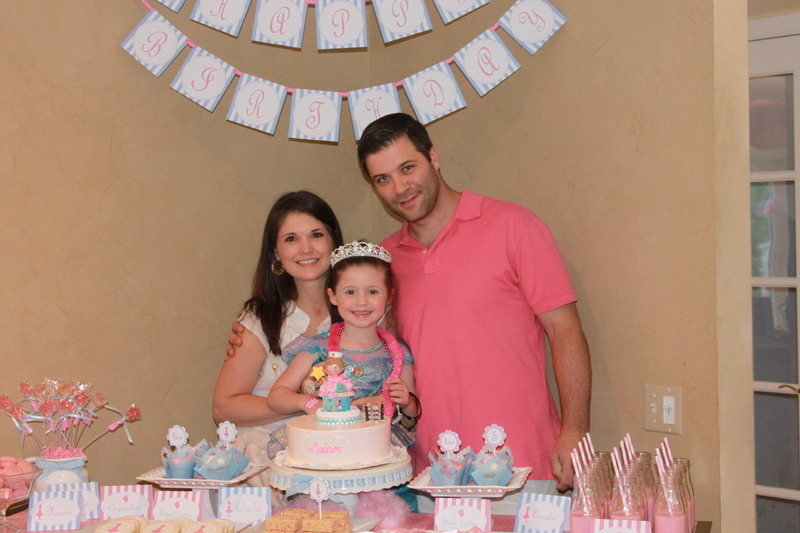 What a milestone…I can’t believe my baby is 5! 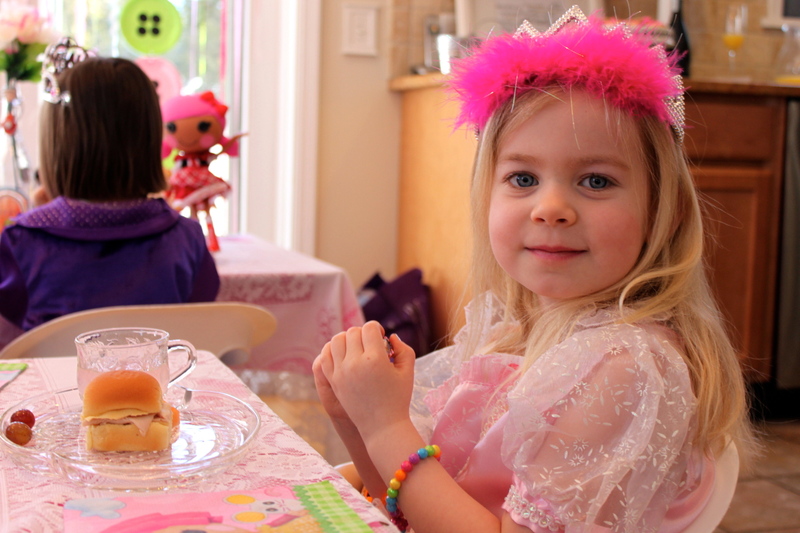 The theme she chose this year was a Princess Tea Party. 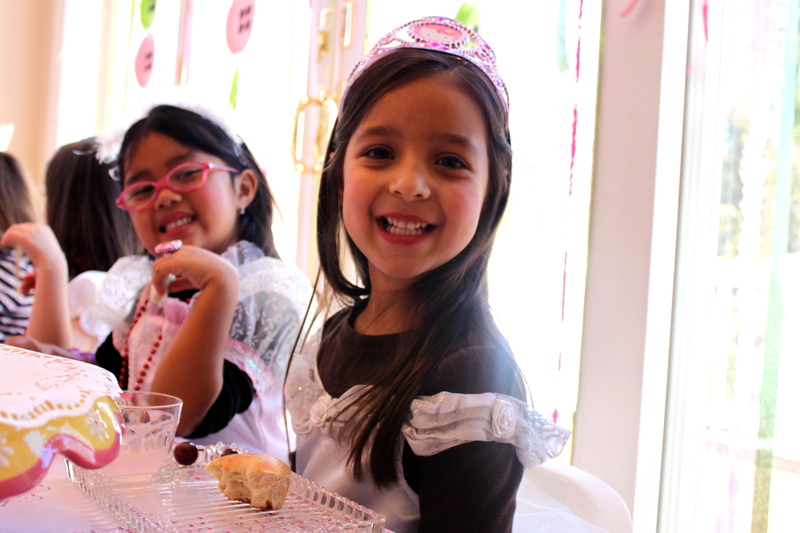 I was very excited to find out her preschool teacher had a small Princess Tea Party business. I booked the date with her and the planning began. 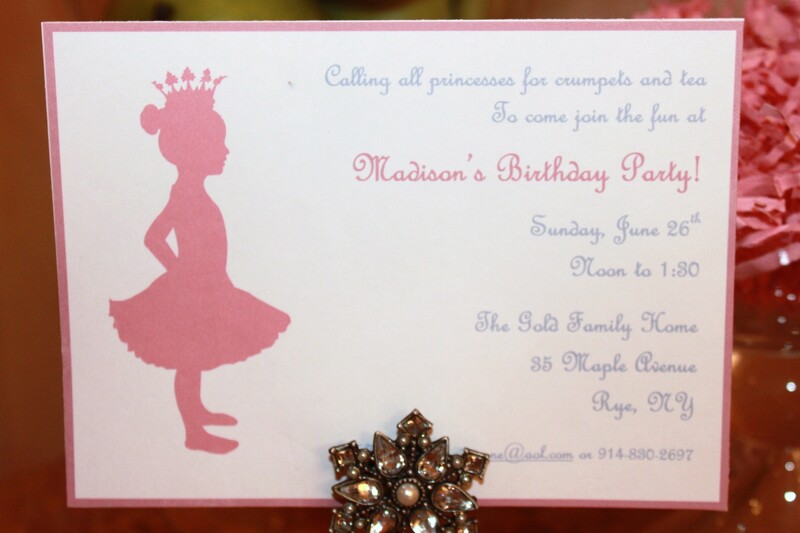 First, I had Madison’s silhouette made by Vana at Le Papier Studio. 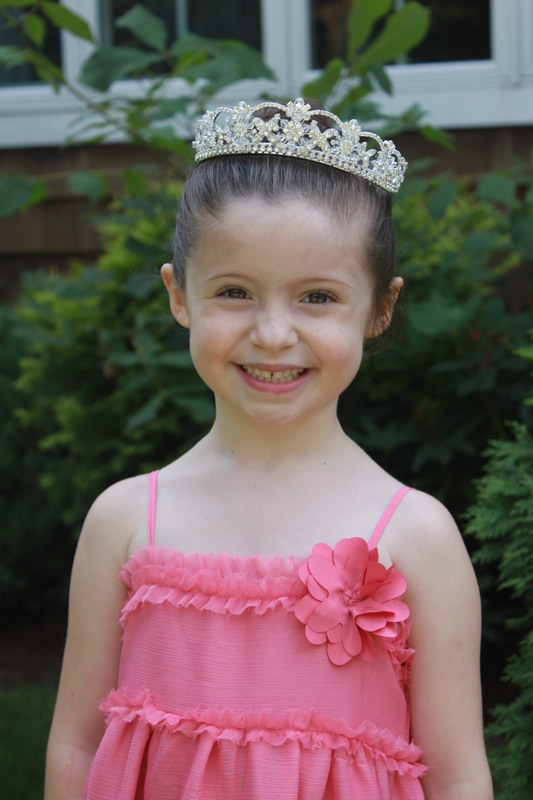 I took a profile shot of Madison and sent it to Vana who came up with a beautiful princess silhouette. I bought the jpeg from her so I could use it throughout all the party decor. 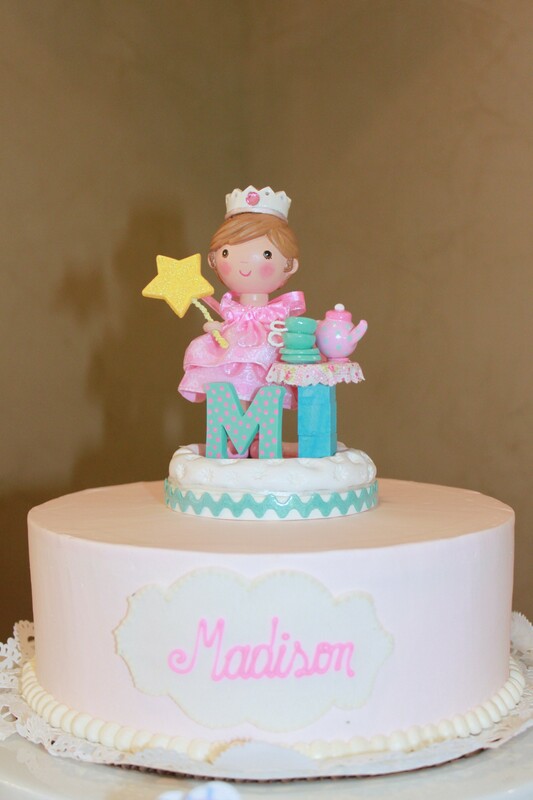 Madison decided she wanted the colors pink and light blue as party colors. I love how it all turned out. Here are the details. 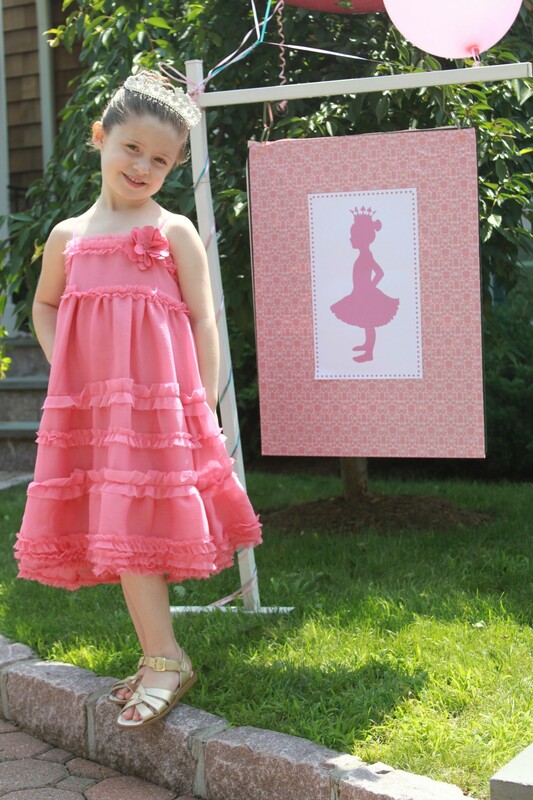 The invitation featured her princess silhouette, very simple and sweet. I made a sign with balloons in the front yard to welcome the party guests. 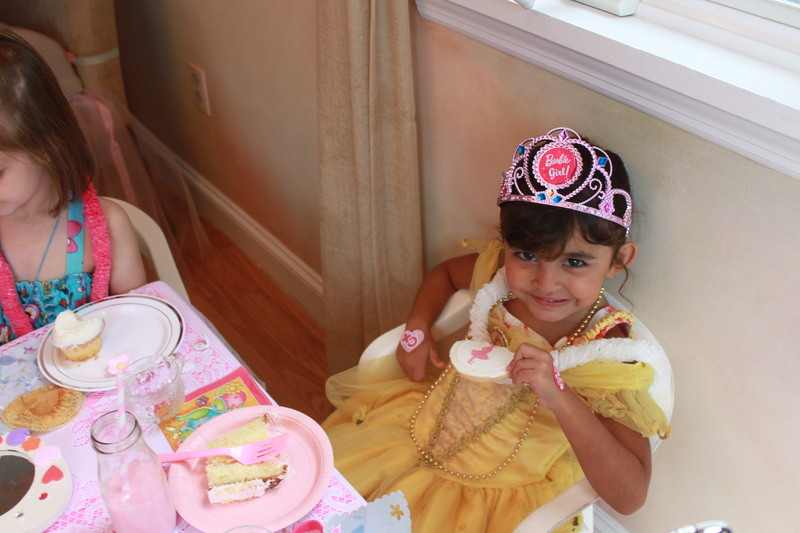 Here is the birthday girl waiting for her friends to arrive. 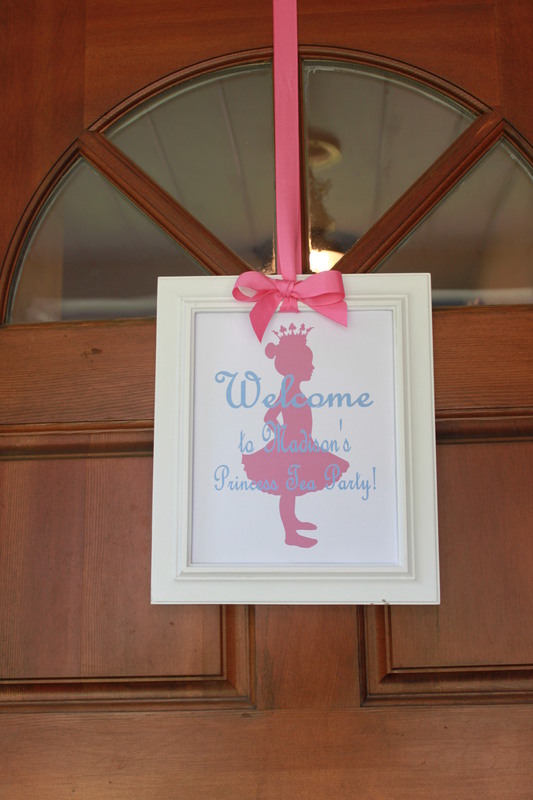 A framed welcome sign hung on the front door. 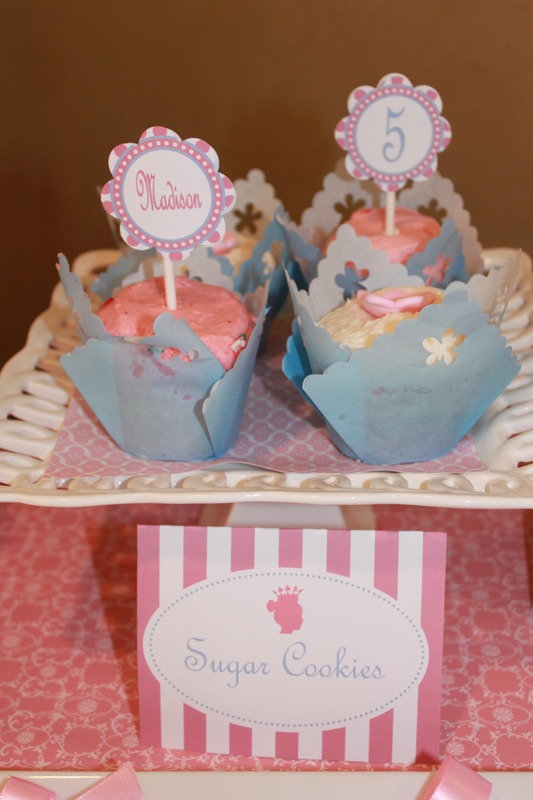 The banner I created hung above the dessert buffet. 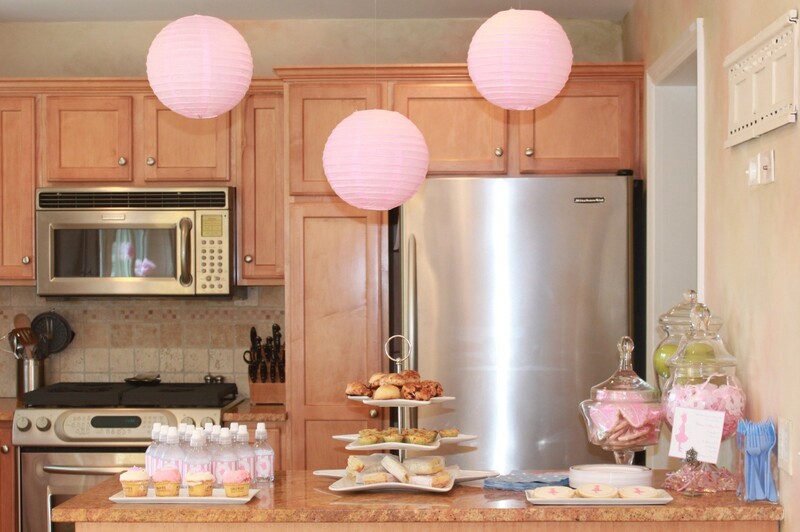 I love placing the dessert buffet in the corner of the room. 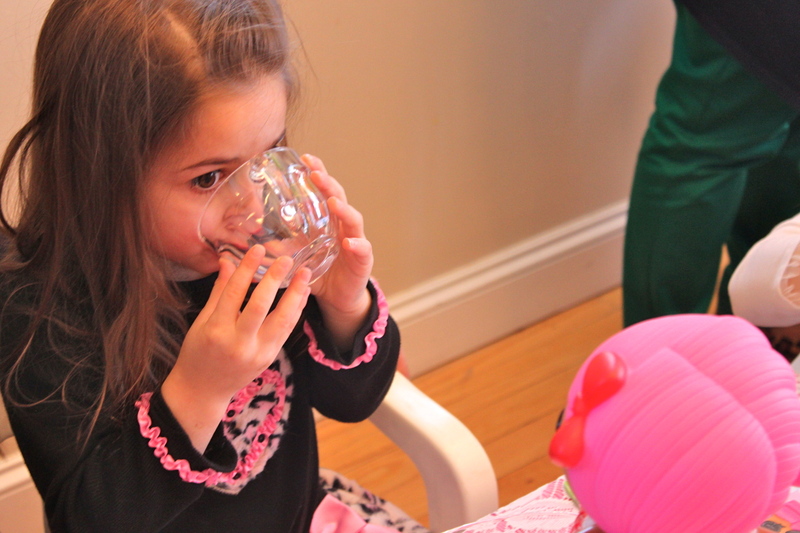 It works well for the birthday girl to stand behind when blowing out the candles. silhouette cookies made by my good friend Brenda…I purchased edible paper decals from The Frosting Gallery on Etsy. Brenda placed them on top of the cookies. Crown cookies from Totally Scrumptious Cookies on Etsy. In the center of the table was the sweet and simple cake from Cornerstone Caterers with a custom-made cake topper made by Sweetie Pie Cake Topper on Etsy. 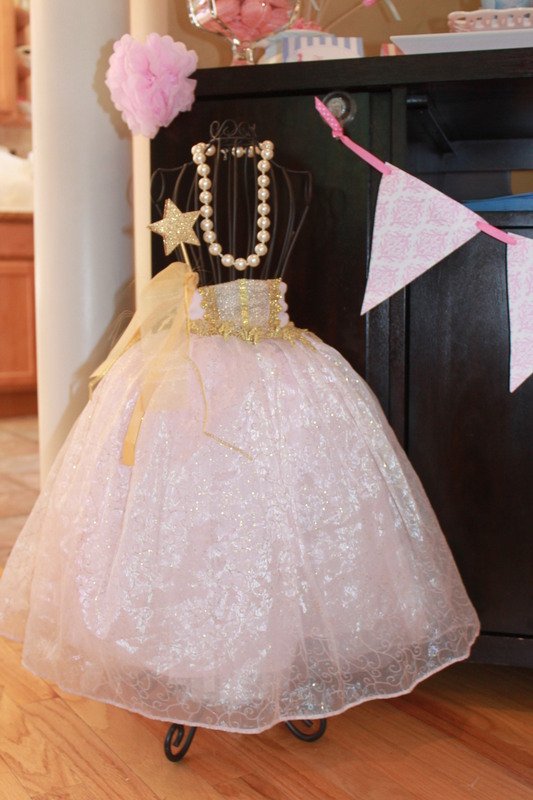 I decorated a wire dress-form I found at Homegoods with a my girls’ princess skirt from their dress up box and my pearl necklace. On the kitchen island I set up adult food for the parents who stuck around. 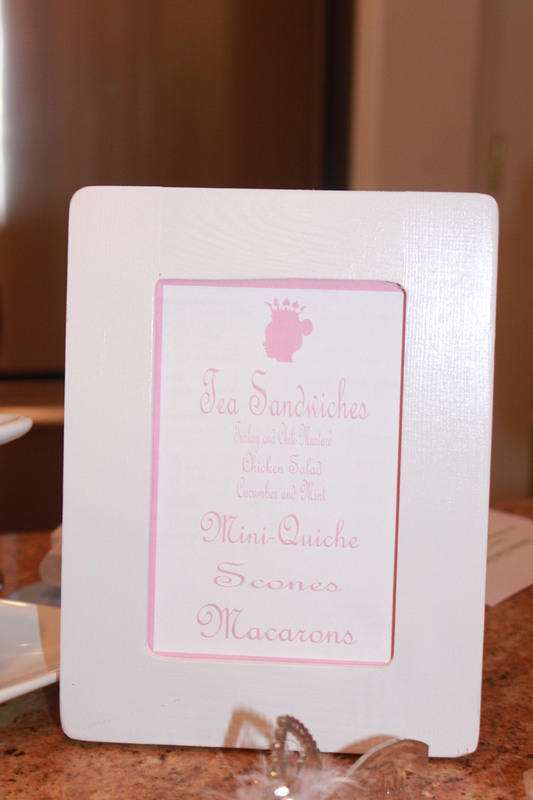 The menu consisted of tea sandwiches, mini Quiche, scones and macarons to go with the theme. 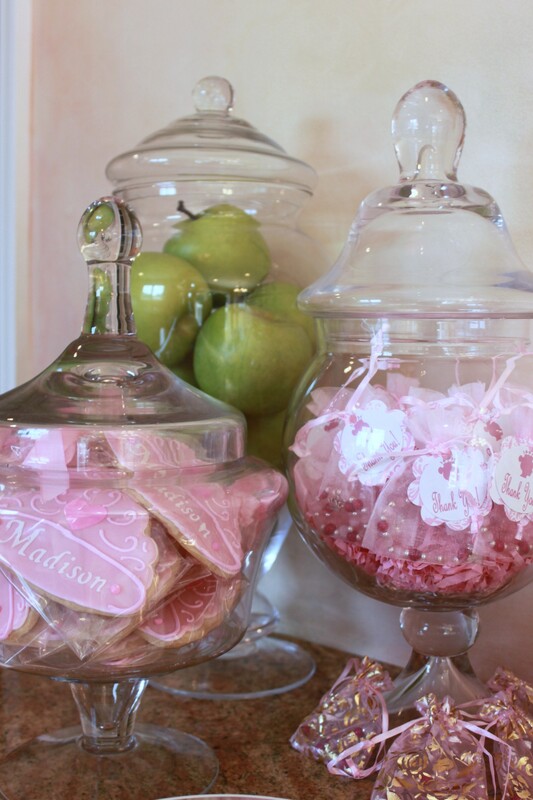 Favors were in my apothecary jars. 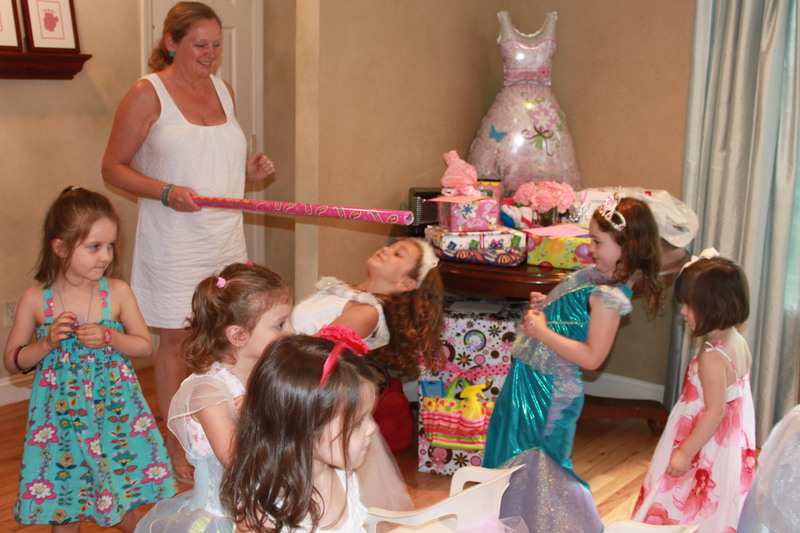 I had bracelets with a princess charm made for the girls and they each went home with a crown cookie and wand lollipop. 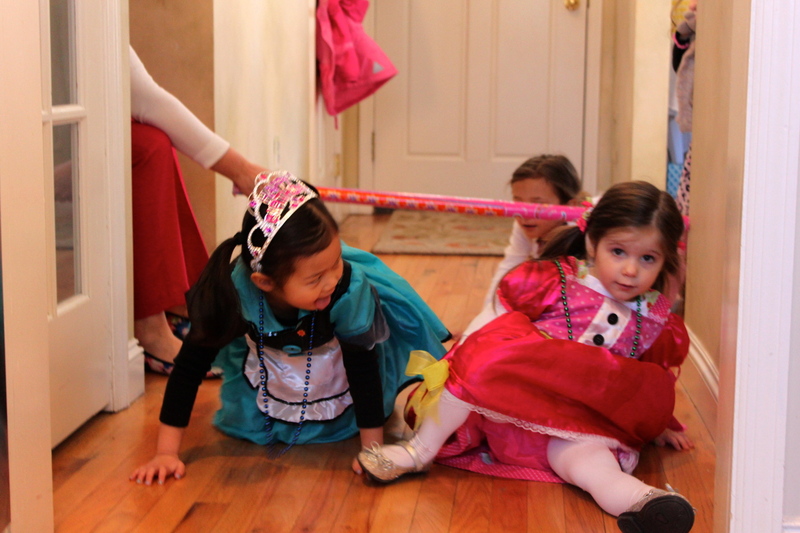 I hired Madison’s preschool teacher for the entertainment since she has a Princess Tea Party business. 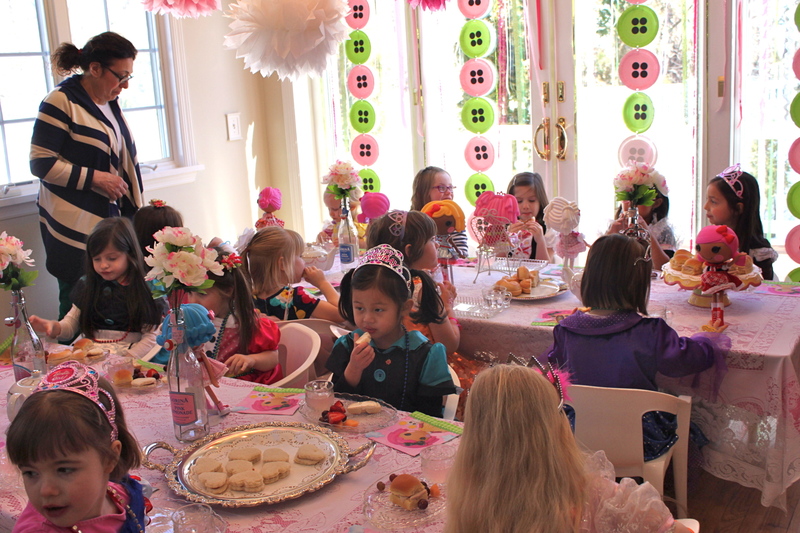 She came with all the table decor, real tea cups and plates, food, drinks, games, prizes and princess dresses. She did an amazing job! 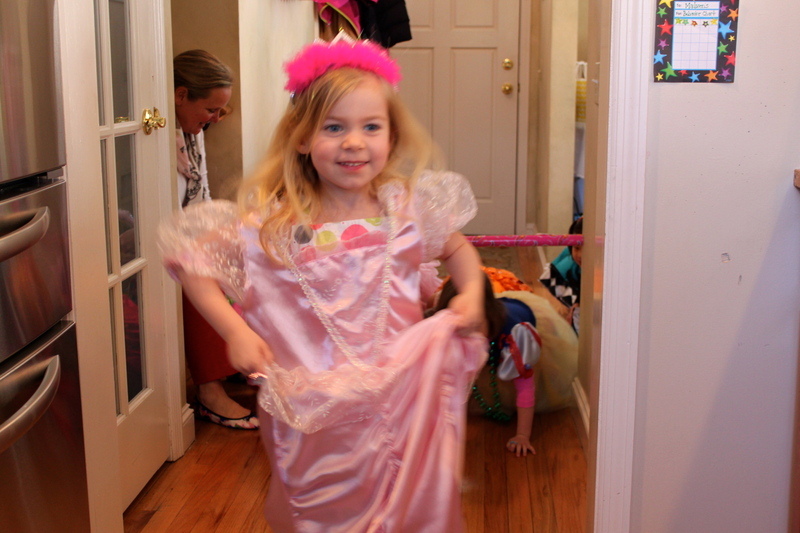 Here is Madison choosing her princess dress. She chose Ariel just like the doll she’s holding. 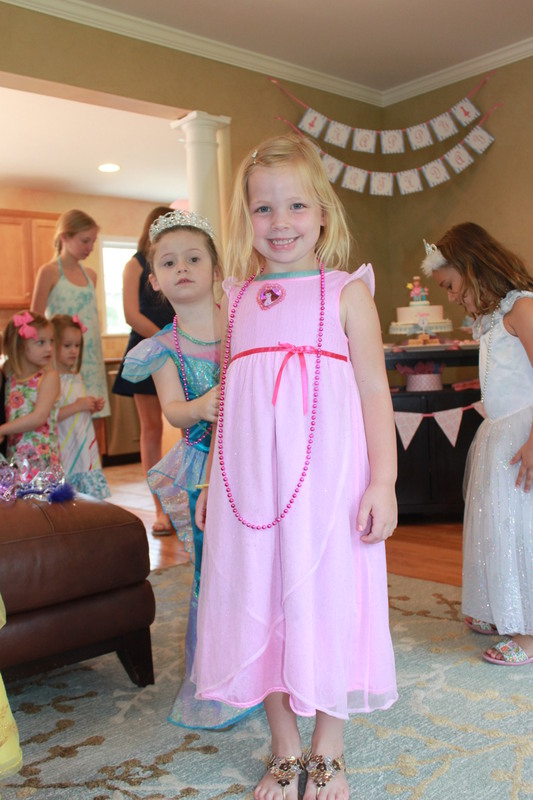 Madison and her friends all dressed up! 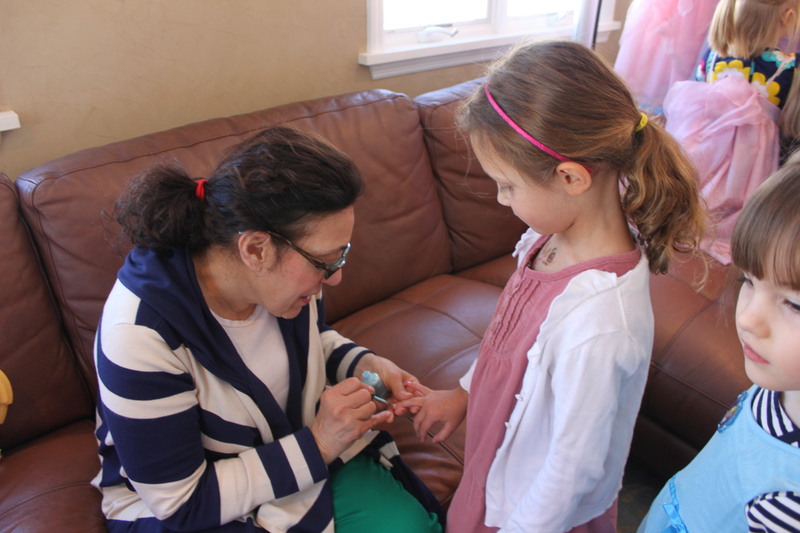 After dressing up, the girls had their make-up and nails done. 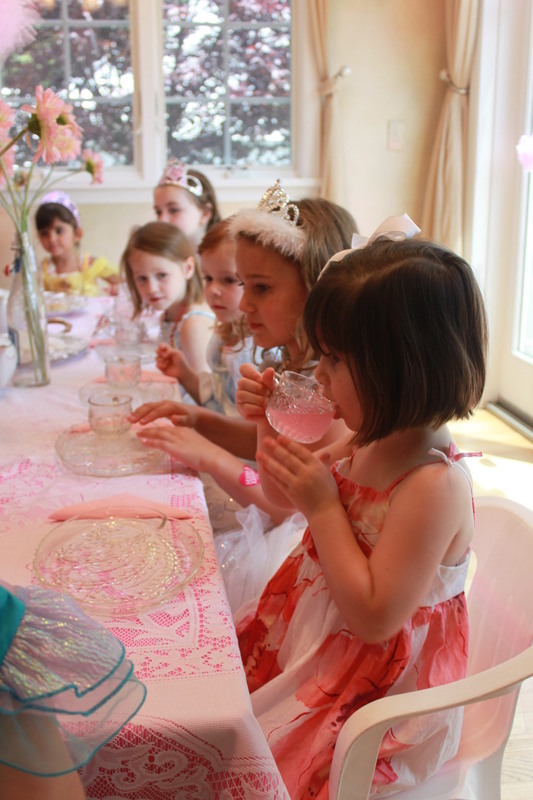 After getting made up, the girls sat down for the tea party. They had tea sandwiches and “lemonade” tea. 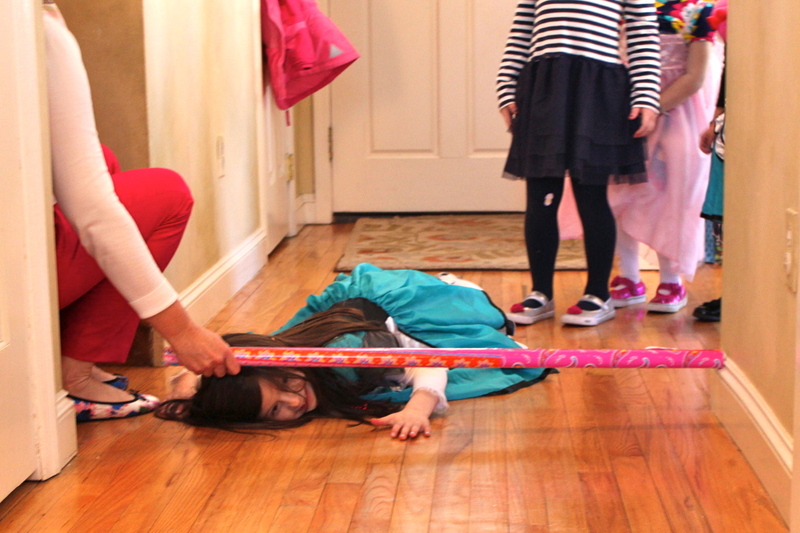 After lunch they participated in a few games…Hot Potato, Freeze Dance and Limbo! 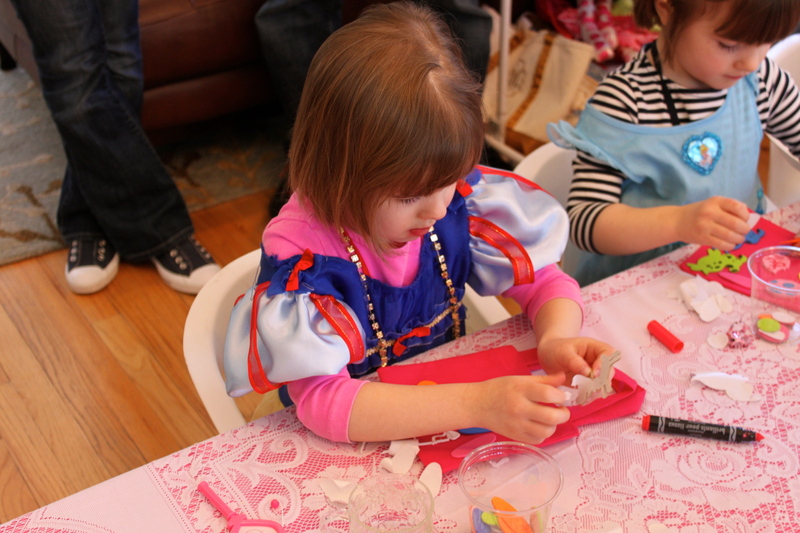 They also made a craft…decorating a mirror. 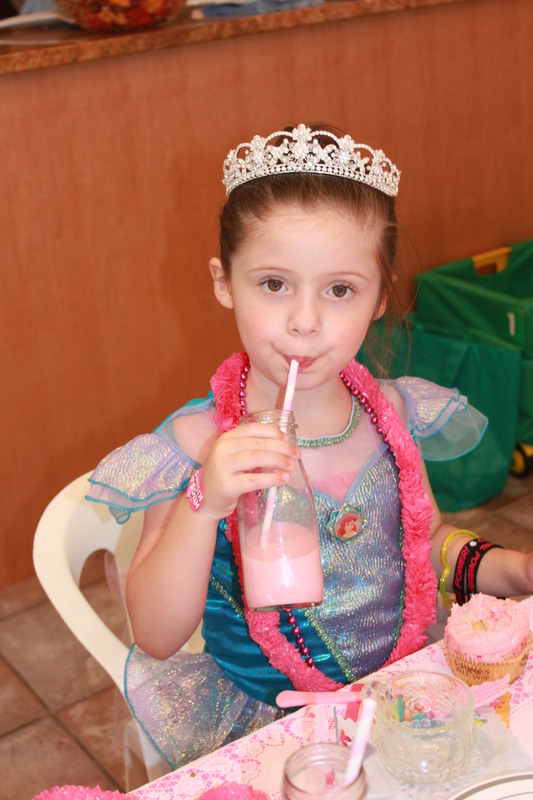 Just before leaving, we sang Happy Birthday and the kids enjoyed cake and treats from the dessert buffet. I was so glad to get a picture of the group. 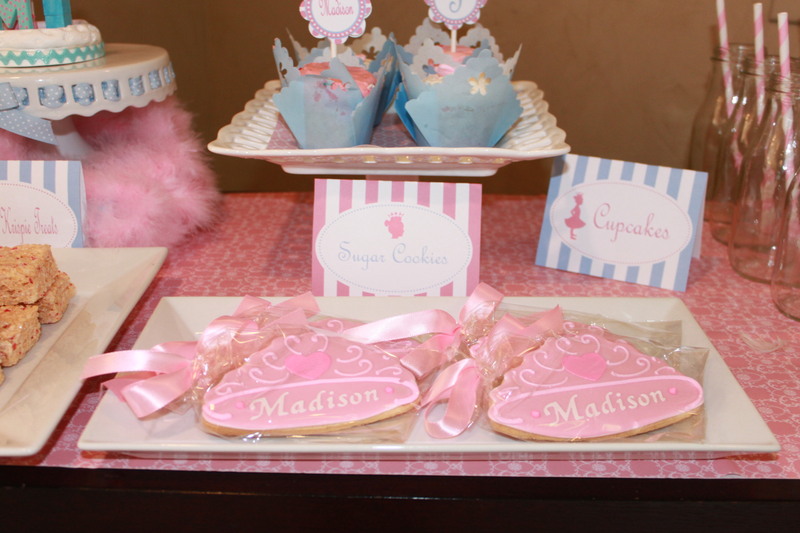 It was such a cute party and Madison had a blast! 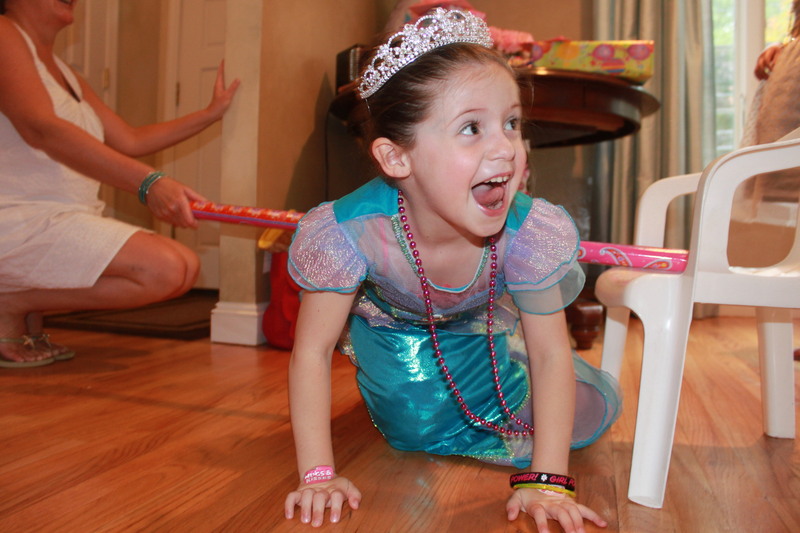 Happy 5th Birthday, Princess Madison! 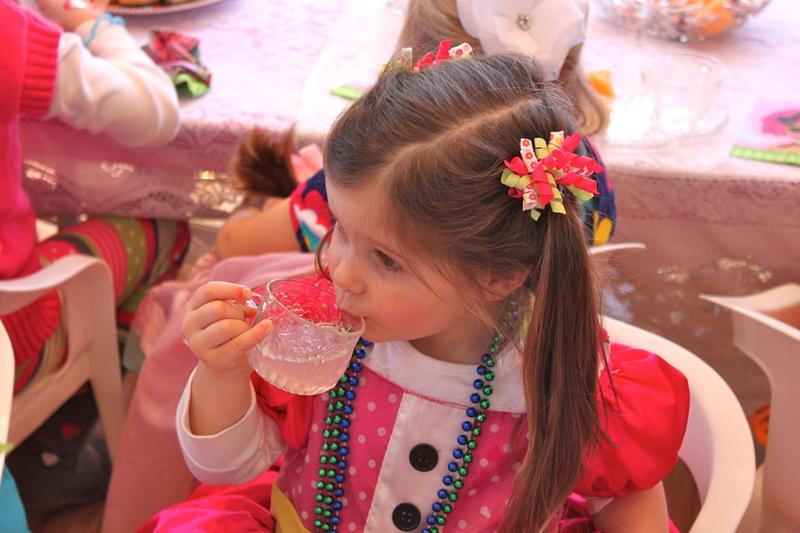 I hope you enjoyed your princess par-TEA!